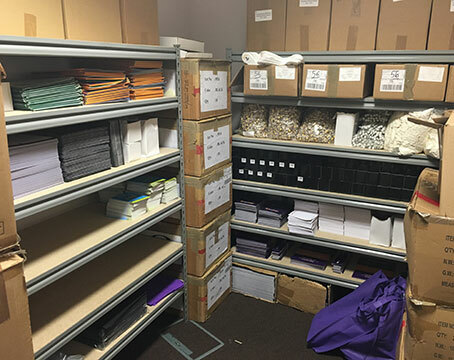 Every part of this order went very smoothly from initial contact, obtaining and discussing quotations, placing the order and delivery which was earlier than expected. 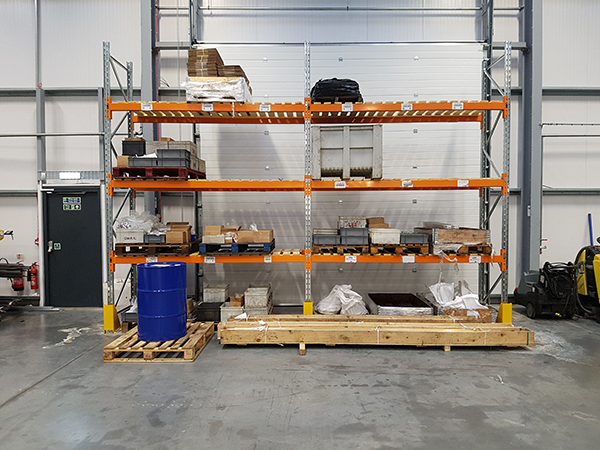 The racking arrived in an excellent condition, went together very easily, is incredibly sturdy and will do the required job for many years to come. 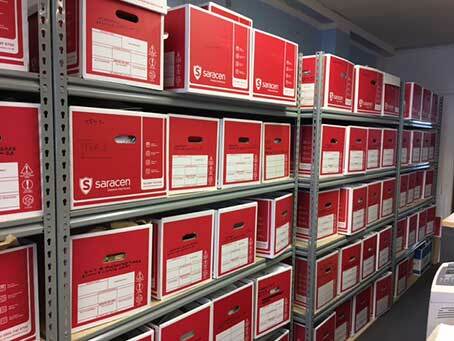 We certainly would not hesitate to use this company again if we ever needed to expand our archive room or create more storage space. 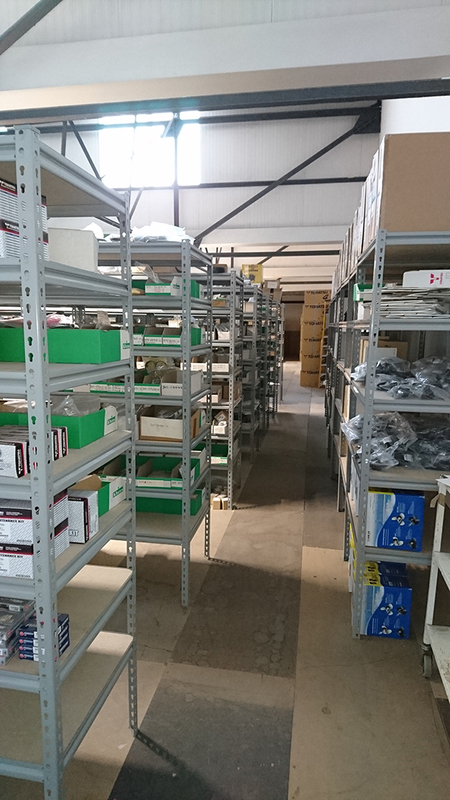 I just wanted to say we’ve been thrilled with all the racking we’ve had from you and the service has been great too. 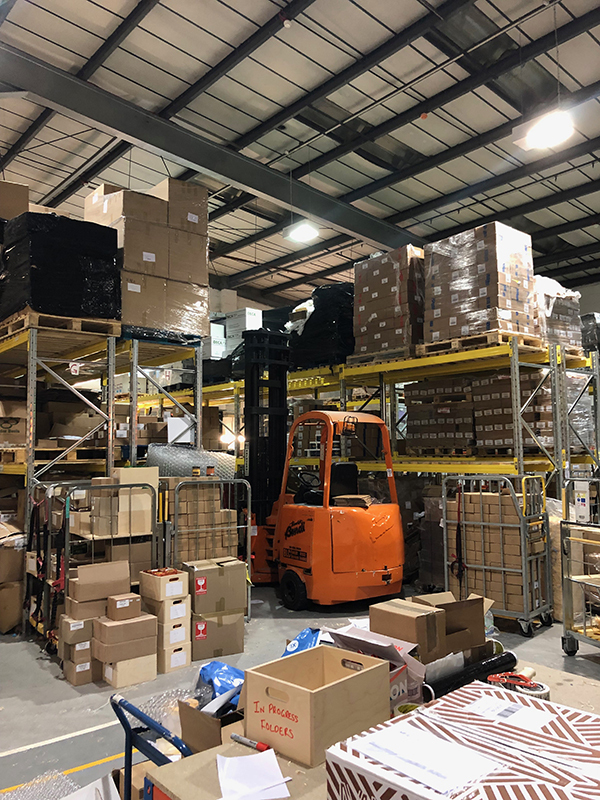 We’ll definitely keep coming back as our warehouse grows. Thanks - the recent shelves are fantastic! Very shelfy! Like them so much that I am buying another one! 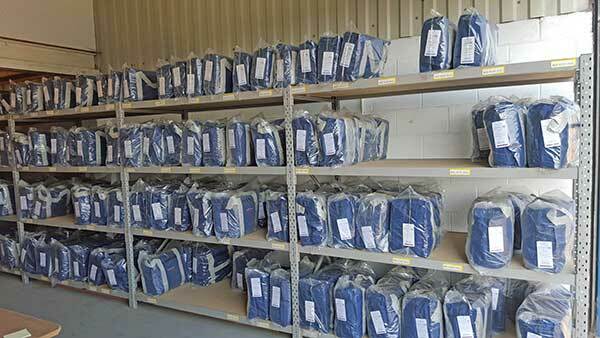 Racking as ordered received in good time and all components present and correct. Racking now in situ and looks “just the ticket”. Very pleased indeed with our purchase and with service received, many thanks. Its gone up very easily. We are a few beams short (which Andy is sorting), so really happy with the purchase! We are very happy with the quality of long-span shelving we purchased! We are more than happy with our beams thank you very much and I’m even happier that I managed to order and receive the same type they are to replace. As always, the service we receive from your good selves is always second to none. 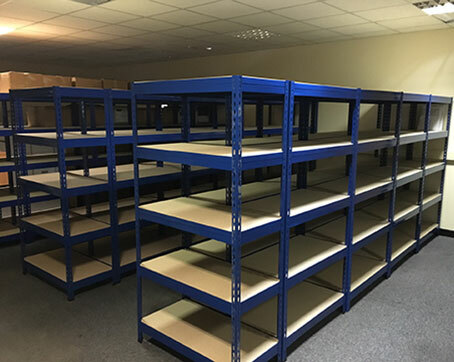 We have purchased from the used racking company time after time, as it’s always good quality, good value and the communications are excellent. Cannot see any reason to look elsewhere for racking! We have ordered from you twice, both with excellent service from yourselves, providing exactly what we wanted and to our tight timescale. 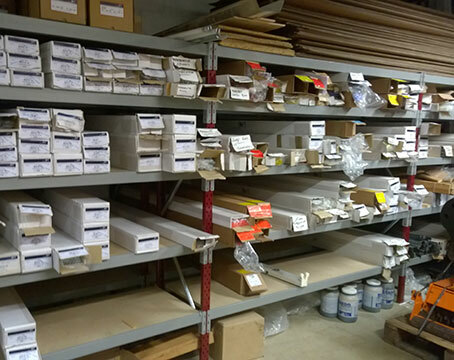 Thanks again to the Used Racking Company, we’ll be sure to use you again when we need our next run of racking. 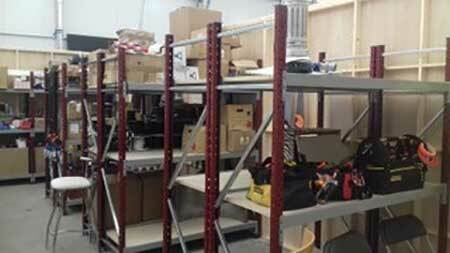 We’ve ordered several work benches and racking from you, for use in our warehouse and laboratory. We’re really pleased with the quality and your fantastic service! Thank you! We are delighted with the most recent order, all fitted perfectly, prompt delivery and good quality. 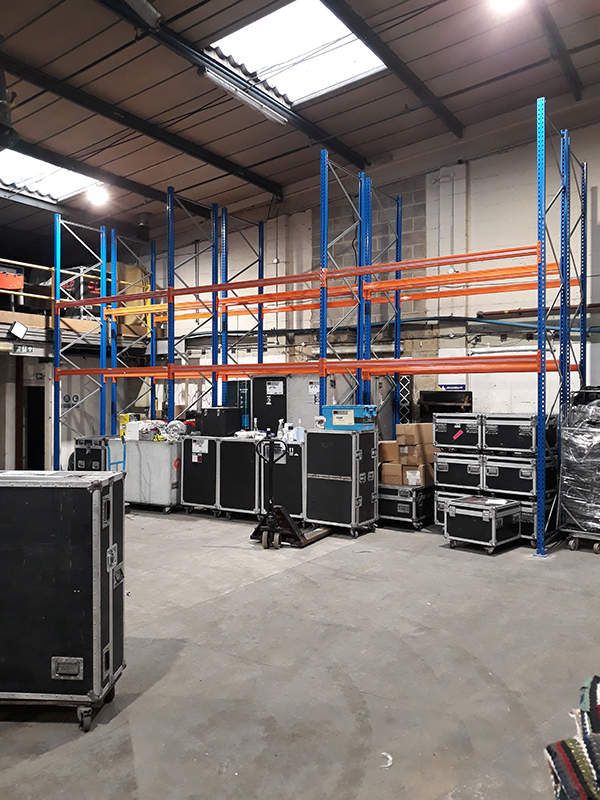 Very happy with the service, delivery was prompt and the guys who came to install it arrived on time and got it up in no time, even taking the time to bolt down our existing racking. No complaints! We are very happy with our purchase thank you. Will be in touch when we need some more. 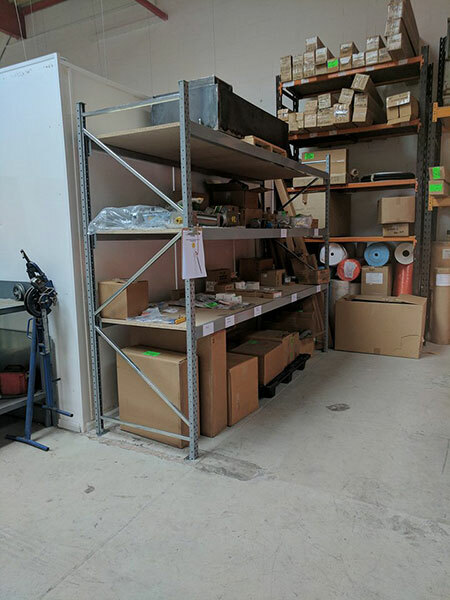 I found The Used Racking Company when trying to get my project back on track after buying some very poor racking from another supplier, sight unseen - never again! 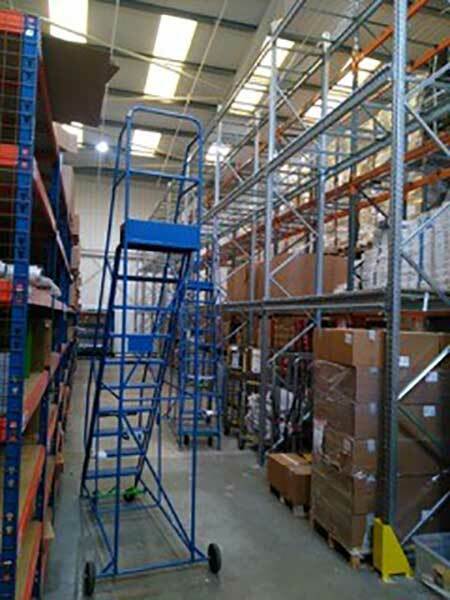 The Used Racking Company has proved to be a superb company to deal with. 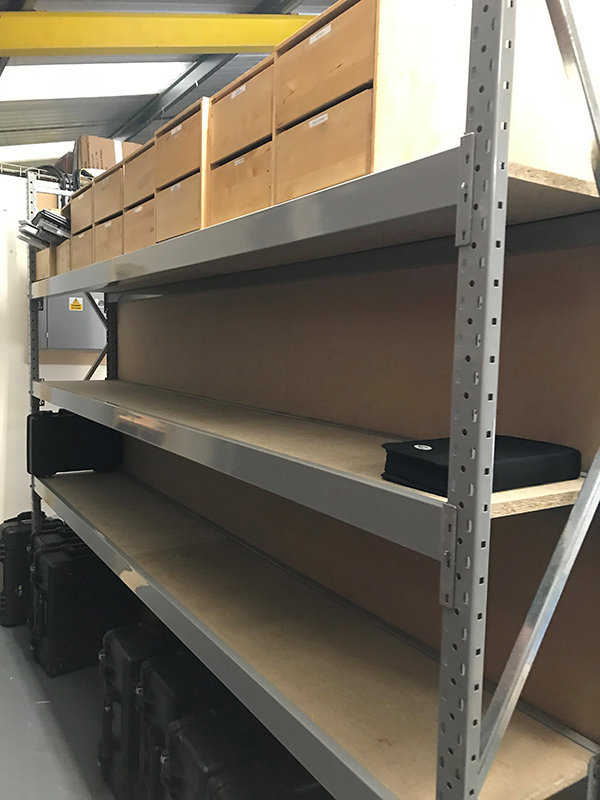 Their range of racking solutions is very wide, but I was helped by one of their team on my first phone call to EXACTLY what I needed. I collected the racking the next day, and it took about 10 minutes to put it together - amazing! I added another small installation, and that went like clockwork also. The value for money compared to my first source is brilliant. The design really works, and each item fits as required with the rest. My order was complete and accurate on both occasions when I collected them. The people I met were all very keen to help, and competent to do so too. I can’t recommend the firm highly enough - don’t bother looking anywhere else. We are very pleased with our new racking. Good all round service – thank you. Looks good too. We are really happy with the recent purchase and really recommend your company! Everything was fine with the last order! All the racking turned up on time and was just what we needed. We were very happy with the service we had. Dave was a pleasure to work with and a great help when it came to the planning. Would definitely recommend yourselves to others. 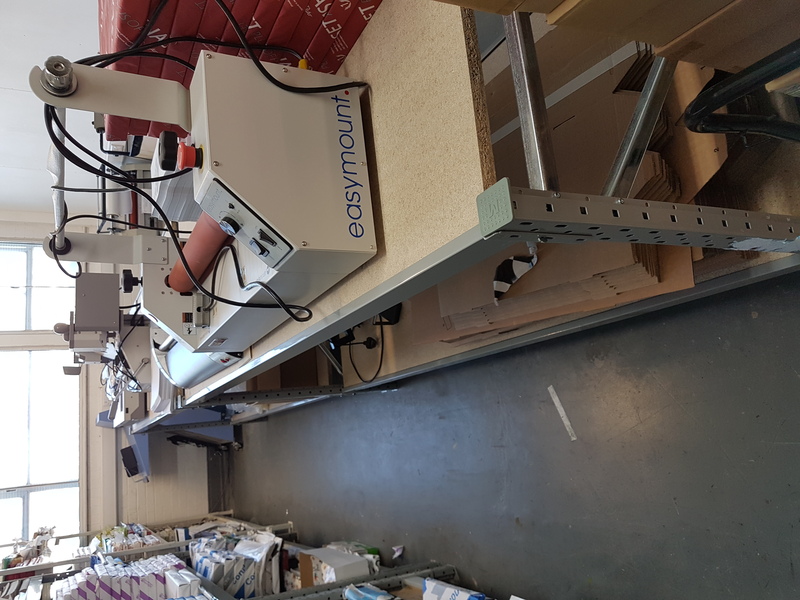 It was a pleasure dealing with Paul M. He made life very easy, I would recommend a visit to your Factory to any potential buyers Great people, great product, fast delivery and great price. Very quick to assemble. Ticks every box! The shelving is great thank you! Both Dave Colley and Sheelagh Ball have been excellent. Dave was happy to answer a million and one questions to ensure that we were happy with our choice of what to buy, he always responded quickly giving me all the information I required. Chalk and cheese different to the response we got from the other racking suppliers we approached, I obviously was unsure of our requirements, one of them responded with 'the information and pricing you require is on our website' so says it all really. We will happily use you again and recommend you to others. All good and installed....Andy Bean and your guy from Northumberland in the warehouse (sorry don't know his name) have been fantastic. 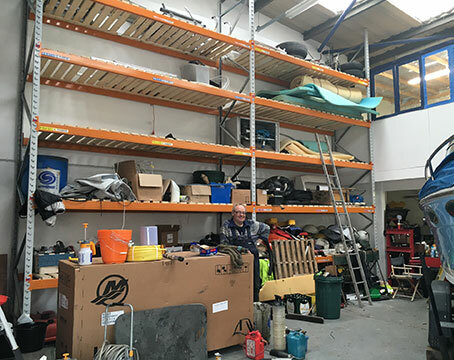 Dave Colley has been ever so helpful, friendly and available at all times to discuss anything and everything regarding our racking. Good luck for 2019!! All good thanks. Not put it all to use yet but will do when I find time. 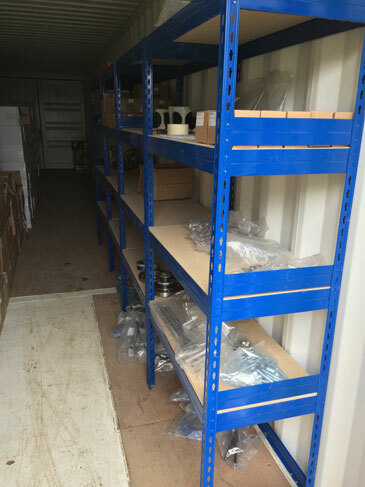 We were happy with the racking and the service, and would re order. 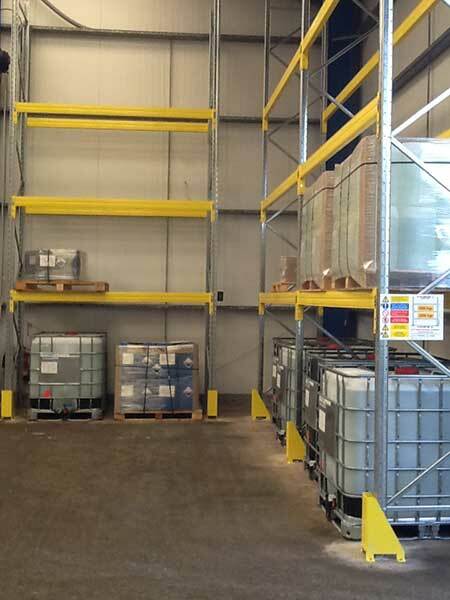 Overall, we were very pleased with the racking and service received. The installation was completed much quicker than we had expected. The only minor disappointment was that on both installation visits, there were some delays that weren't communicated to us. On the first phase, the team turned up to begin installation, but the parts didn't arrive until more than 1 hour later. On the 2nd phase, the team turned up later than planned as they attended another job first thing that morning. Although installation was still completed quickly, it was frustrating not being made aware of these delays. The racking was great, it’s all been put up and probably full by now! We were very happy with the service provided. We had to cancel the first installation date as we had a delay in our building. Your team were very accommodating and were very helpful when we came up with a new date. We would certainly highly recommend your company. The racking was great and we will probably take some more from you! It was delivered and is all up and being used. Very pleased with the service and won’t hesitate to use your company again in the future. The service we have always received from your company is as always top drawer. Thank you and yes we are very happy with our purchase, will come back if and when we require anything else! All received and installed to my satisfaction, many thanks! 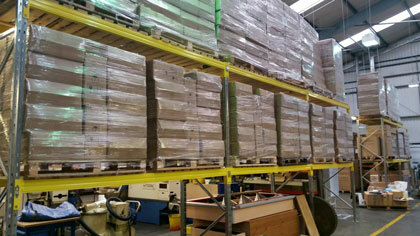 Many thanks indeed for the pallet racking. It arrived on time and in top condition, we have installed it, it looks good and it is holding some of our fine teas. Very many thanks indeed! Yes we are happy with the service and products provided. If only something could be sorted out with the deliveries as that’s the bit that makes it very expensive! Yes, all fine, thank you! Very pleased as usual - I will need some more racking in the new year! Thanks again to T.U.R.C. for another great piece of service. 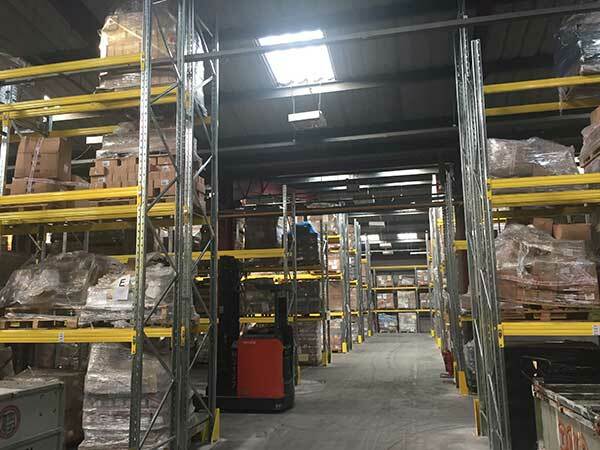 We have been impressed with the products received from The Used Racking Company and find the company very efficient in processing our requirements. 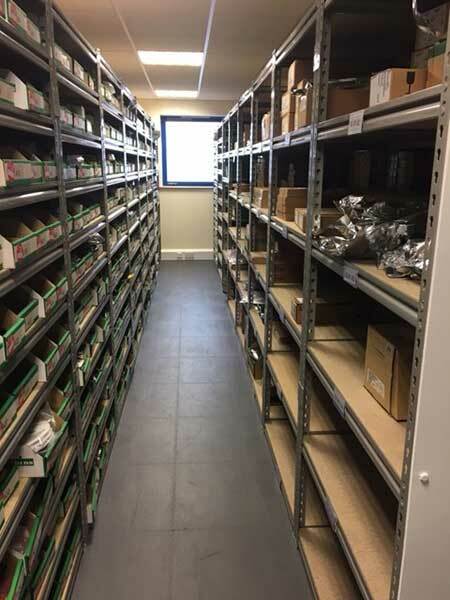 The products are extremely adaptable and the locking systems ensure that as our company progresses we can adjust/add to the racking in a double quick time. 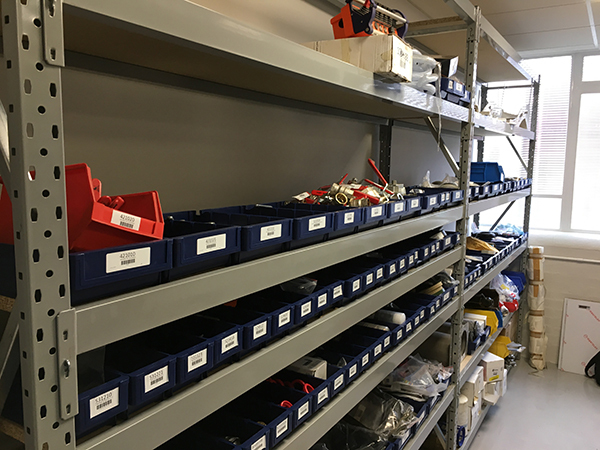 We have been using the Longspan Shelving now for over 9 years having placed numerous orders over that time as we’ve expanded. 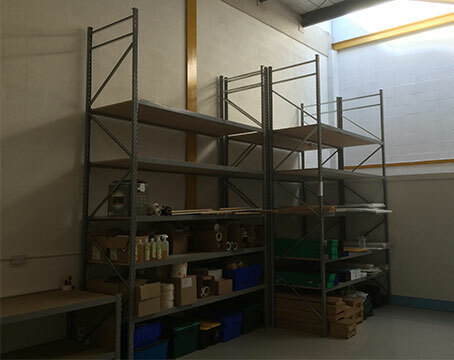 We are extremely happy with the product and would recommend both the shelving and the service from the Used Racking Company. As ever, really easy to deal with you. 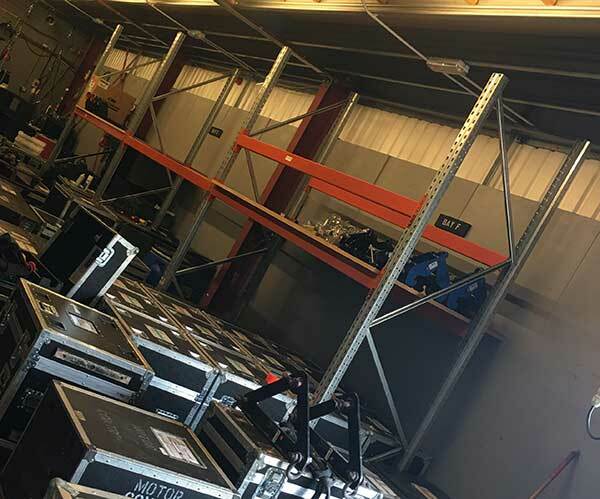 We use your racking in the warehouse to store flight cases on but also on site to put projectors on. Thankyou for the racking, once again a fast efficient service, the guys said it went together very easy and looks good - but I haven’t seen it yet because it's in another unit, its raining and I haven’t got an umbrella!! Seriously though, thanks! Great service as always, thank you! Yes all good - very happy thanks! We are very happy with our racking. It is just what we needed to give us more storage space. I found both the ordering and installation process to be an efficient and smooth process with yourselves. You did everything you said you would, on time and as assured. 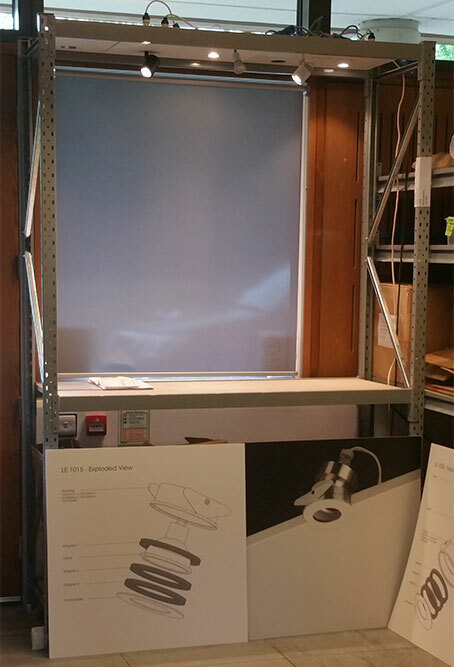 The installation engineers were helpful and accommodating and completed the work in a small amount of time. I’d definitely recommend your company and will be using you again for future requirements. 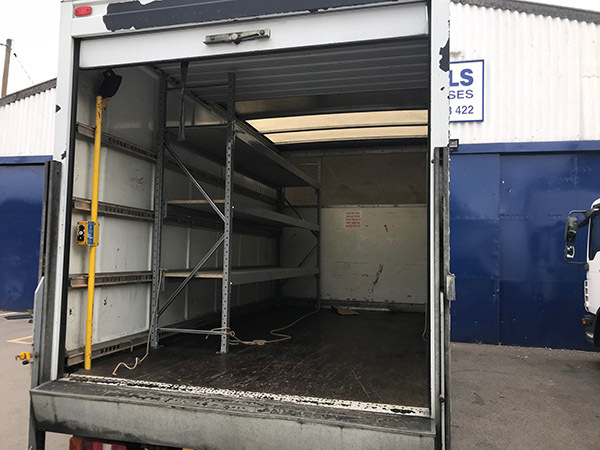 The service we had from your company was brilliant, Paul Moorfield was very helpful when we realised that we should have ordered different racking and got the exchange sorted out no bother. Racking arrived in perfect condition and is now fully loaded with material in the graphics department, many thanks for a great service. We had a really efficient service, from some lovely friendly staff! My pallet racking frames arrived, I am very pleased with them thanks for your time and help. On behalf of White Bird, I would like to thank you for the excellent level of services your organization has provided to us. The time management and service quality were found to be excellent and on par with any global standards. I appreciate your accurate planning and productivity which has won our hearts. We are happy with items! 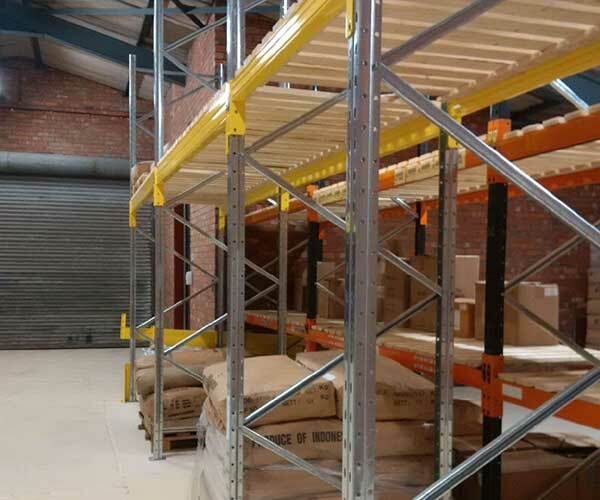 We had used the Used Racking company before in a previous business so didn't hesitate to get a quote from them again. Before making an order we were able to visit their site to discuss our options and what they could provide us. 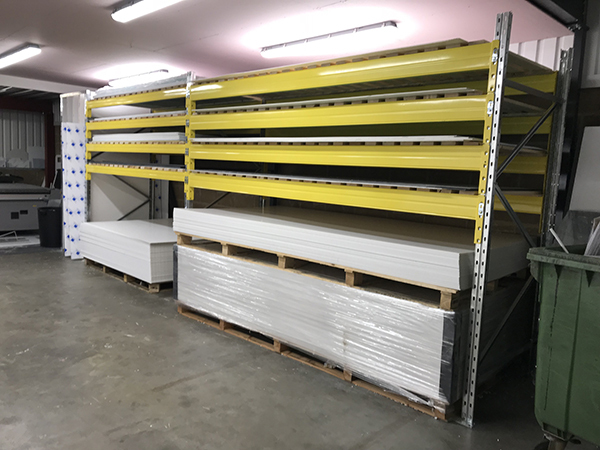 Once we placed our first order we were informed exactly when our order would be delivered and when the install team would install our racking. 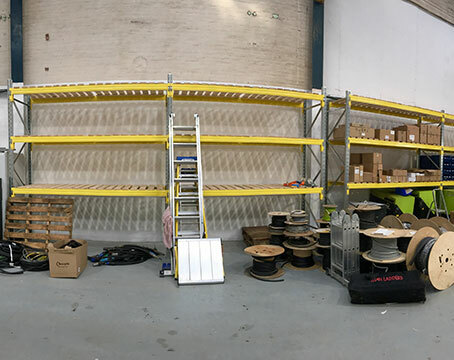 The order turned up when we were told it would and the following day the install team turned up and has our racking installed in a few short hours. Nothing was to much trouble even building the racking around a temporary toilet. The racking maybe used but it will serve us well for many years. We were so happy we placed a 2nd order a week later and again the order turned up when we were told it would, we decided to install it ourselves which turns out is a lot harder than the install team made it look. 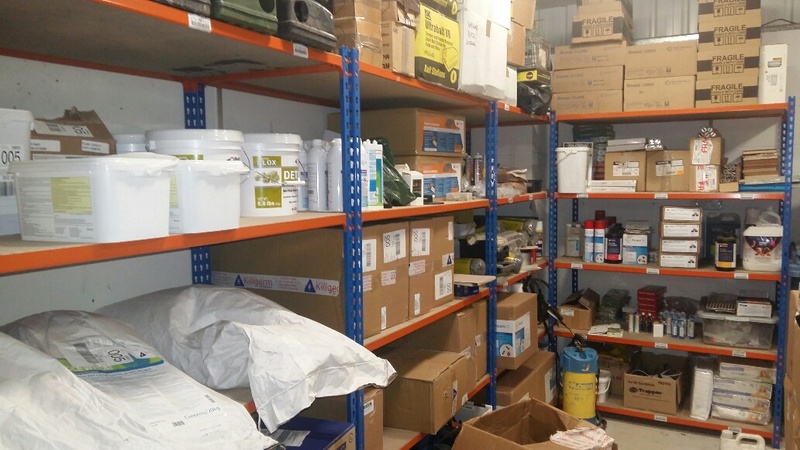 We have even got lockers, coshh cabinet and pallet truck all without any problems, can't ask for more. 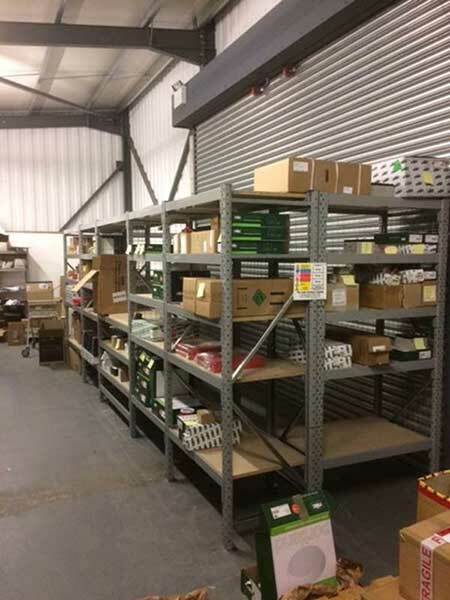 Top service from The Used Racking Company. 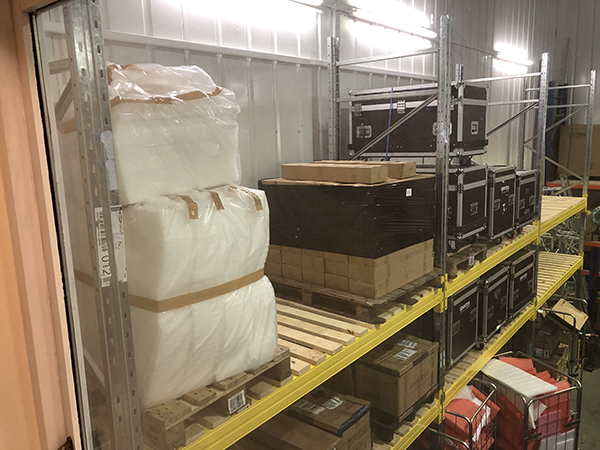 I’ve been a film and television location unit manager for 12 years using many types of location vans and I find and highly recommend the used racking company for its large selection of quality racking for every situation. 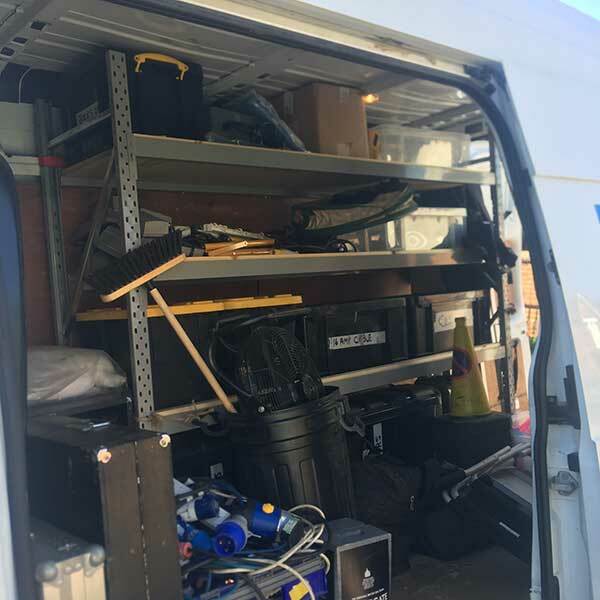 I now only use this perfect system for all my location vans as the racking system is quick and easy to set and remove, when required, from any of our hired vehicles. Thank you and I must point out all the staff are very helpful and ready to find the perfect match to any van. Yes everything is great with them. Thanks for all your assistance with them! I would just like to say, “ you did it again”. 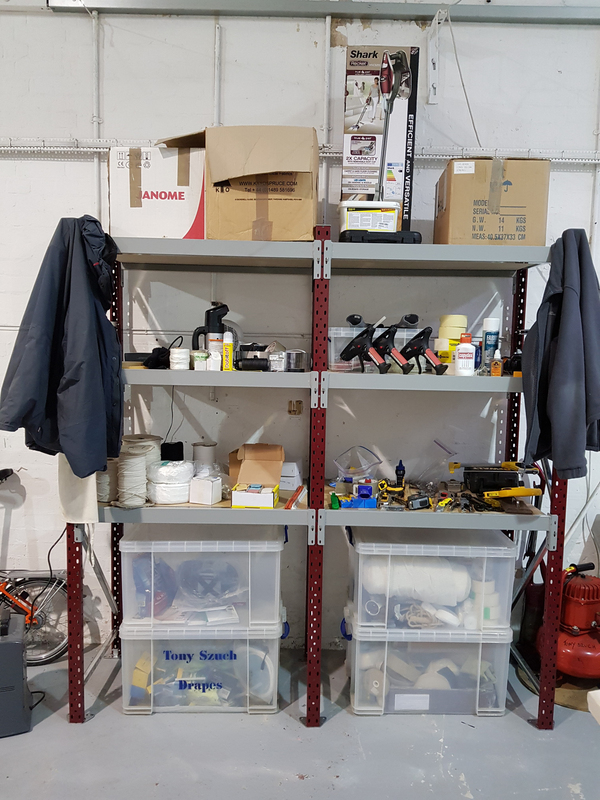 Great efficient and friendly service team and we are pleased with the used racking, still good quality and will do just the job. Yes, the shelves are great but I have to say there was no way that a little old pensioner, like myself, could have even lifted the stuff, let alone fixed them! Luckily my son was around to do the job for me! 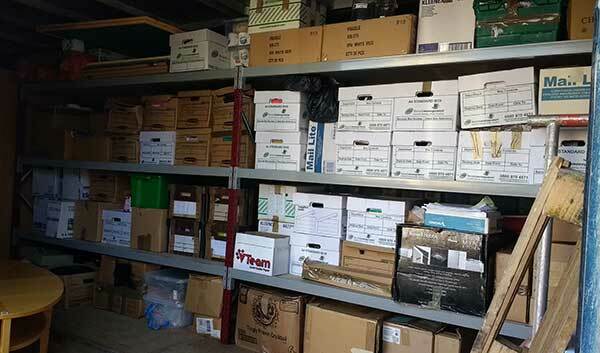 :) Apart from that, great company and would like to say I will use you again, but hopefully, I won't need any more storage shelves, as I need to clear out the clutter! Your guys did an excellent job! Racking excellent condition and the beams. Service on top of the range 6 ******. Thank you for your support I will use you in future! It arrived ok and it's fit for purpose. Thank you! I can confirm the racking is ideal for what we need and we may buy more of the same type from you in the near future. 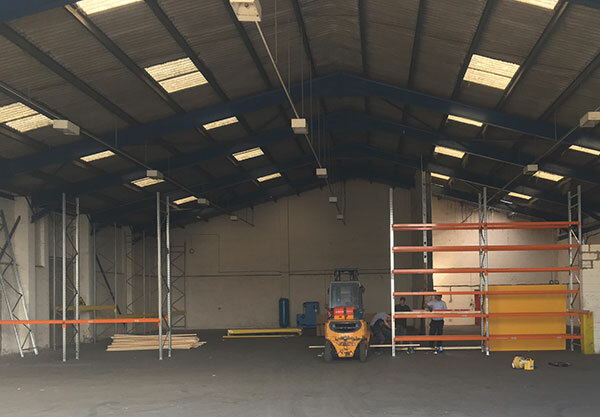 I did have a slight problem in getting the delivery date finalised but when I did it arrived in the next morning and the two men did a great job in putting it up in the afternoon and they also consulted me as they were putting up the racking on the different combinations I could have. I would recommend your company to anyone. The service that your company provided was absolutely outstanding, Very polite and friendly Lady took our order Invoice was through within 30 minutes Paid and was able to pickup within a couple of days Highly recommend! 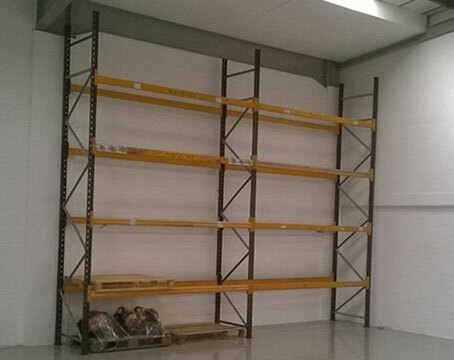 Thank you very much, we are more than happy with the racking and the service! Service from you was great. Very quick to respond and the info provided was also very clear. Had a great first experience with the Used Racking Company. 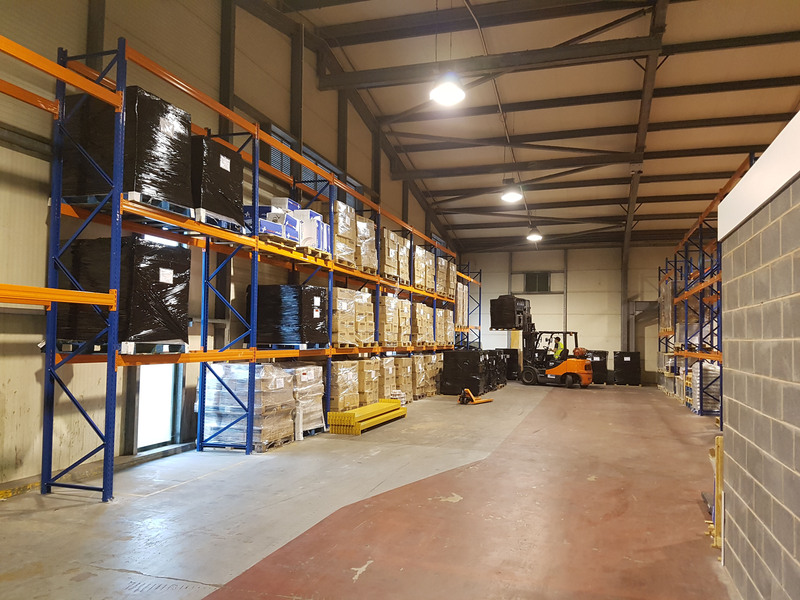 Sheelagh was very helpful on both the phone and via email and helped us choose the most suitable racking for our packing area. 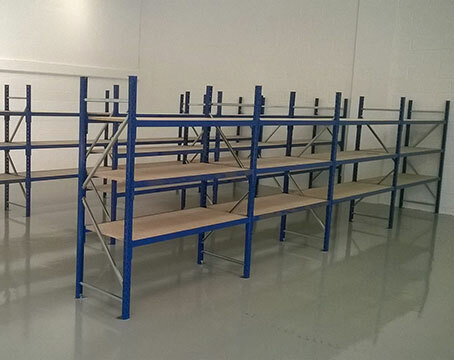 The racking was delivered within 7 days as promised and was in very good condition. 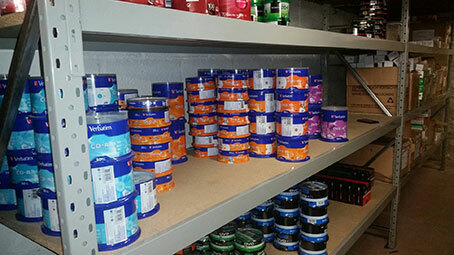 Overall the quality is fantastic and has provided us with far more space for our products as we expand our range. We will definitely be using this company again in the future! What you have provided has suited our needs very well! Very happy with the racking and the good service. Many Thanks again, I would highly recommend The Used Racking Company. Everything perfect from our order! We were very happy with the level of service, both you and Kevin were really helpful. Thank you very much for all your assistance. The product is very good, the service which was provided is also amazing :) thank you! 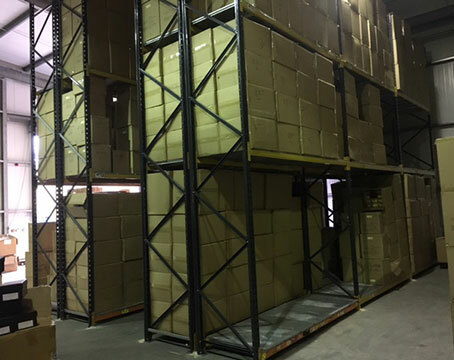 This is our 3rd order to Used Racking Company. 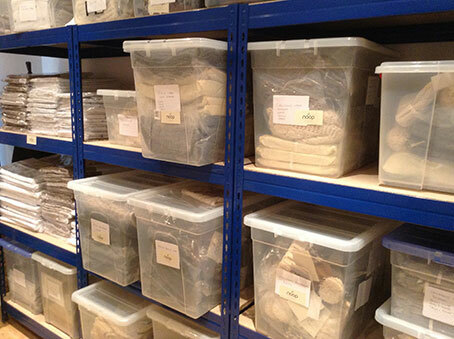 We have now extended our racking and made our storage and organisation of stock much better. 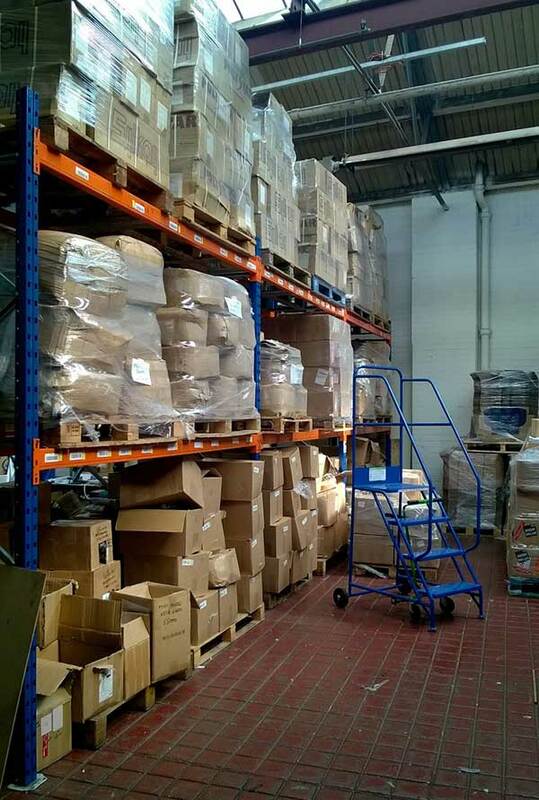 Happy warehouse! 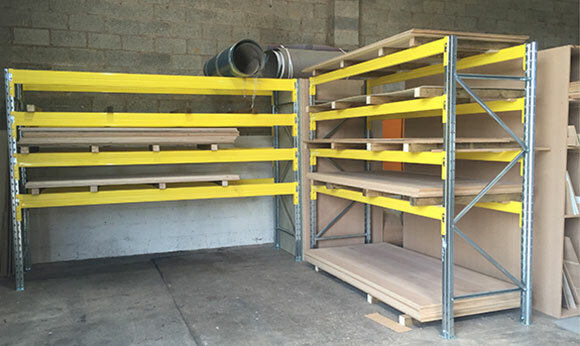 We had an excellent level of service in buying shelving from you guys. 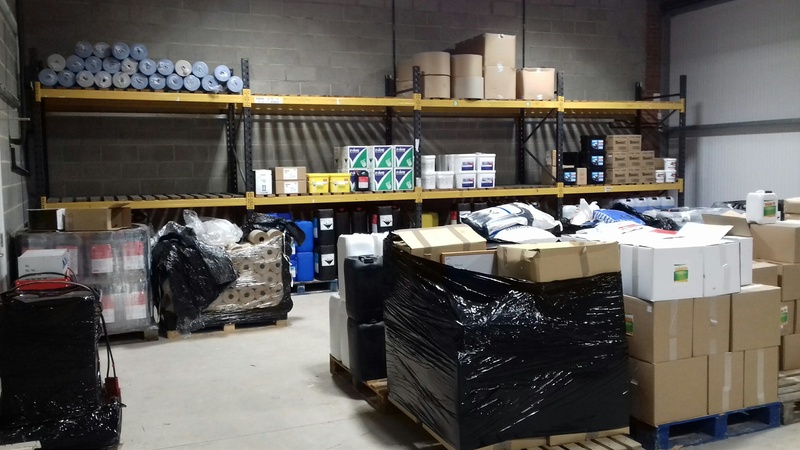 We have found you helpful over the phone and on email when we’ve needed help identifying existing shelving in our warehouse and subsequently using that to buy more shelving from you. The pallet racking beams were brilliant. Worked great. Service received was outstanding, helpful staff and great service. 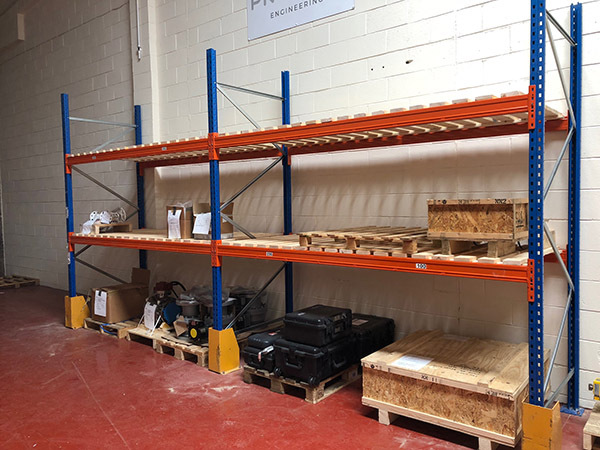 We are entirely satisfied with the service provided and the new ‘used’ racking fits right in as it matches our existing (which can be seen at the periphery of the frame on either side). 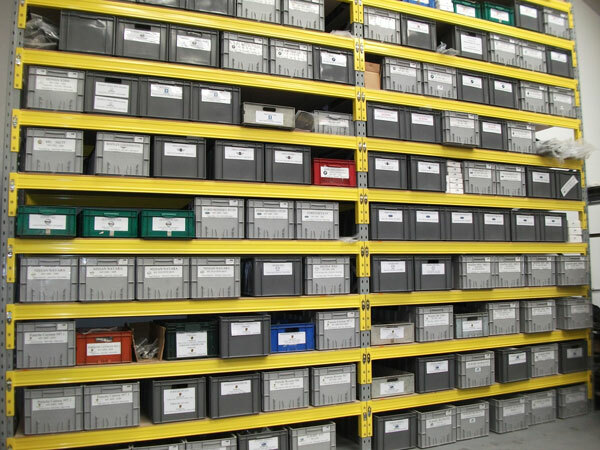 When looking for shelving there is a mine field of companies offering this and that. However, if you need to speak to somebody to discuss your requirements it soon becomes apparent that not all glitzy companies are all they are crack up to be. Often the products they offer are not as strong as portrayed and require a huge amount of time to assemble. 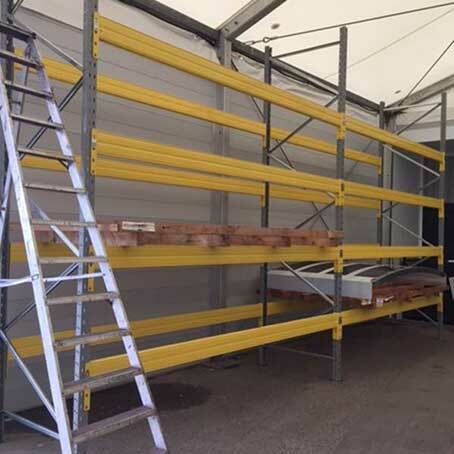 The Used Racking Company stand out from the crowd, there knowledge, advice and support is second to none. The product they advised us on is absolutely brilliant. It’s very strong and so very simple to assemble and disassemble if required, none of this nut and bolt stuff many other companies offer. Delivery was very prompt and goods arrived in perfect condition. 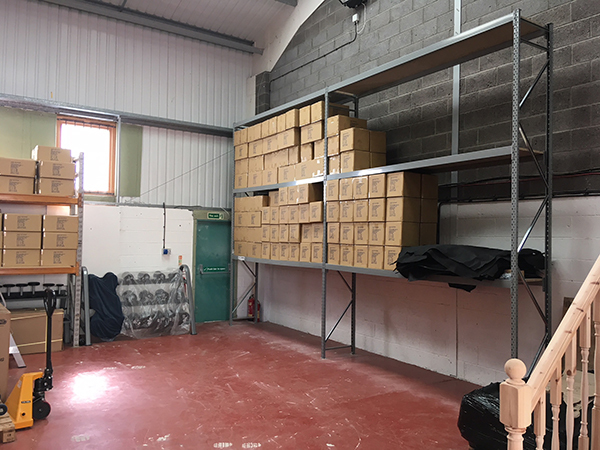 So if you are looking for good quality racking and support to match then we would most certainly recommend this company to anyone. The racking and install were great thank you. We really appreciate your efficient and effective service! Very impressed and easy to assemble. Great service. Really happy with the tables - Thanks! Both of our orders are very much in use. Ordered without friction. Delivered with care and expeditiously. Another positive experience. Telephone ordering and confirmation process very straightforward and reassuring. We're a small charity, and the care, cost & reliability are very welcome. 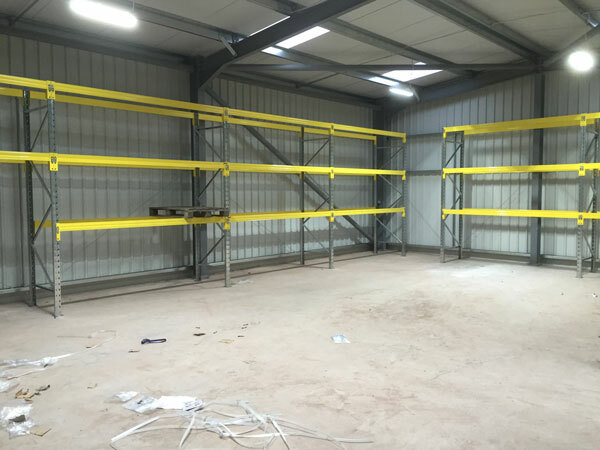 The installation team were quick and efficient and had the racking set up within the agreed time. 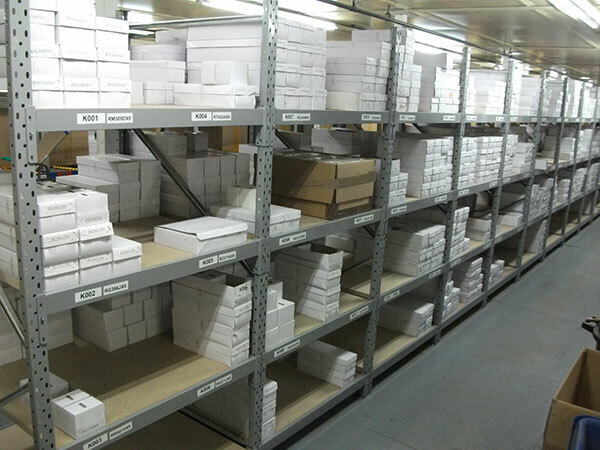 Collection of our stock from yourselves went smoothly as well. This is the second time we have used your company for installations and both times we have received great service. 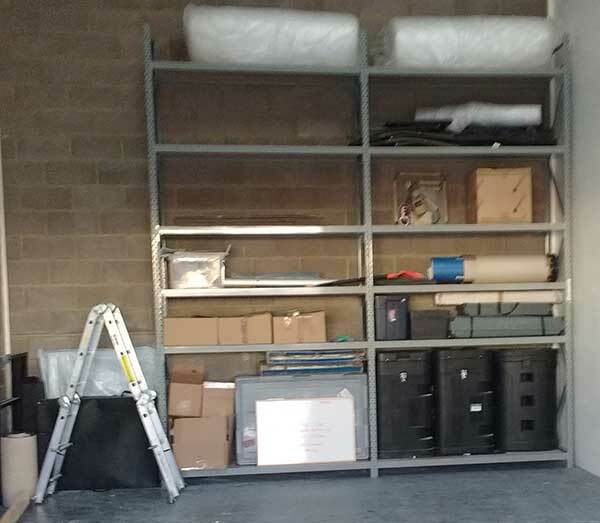 I bought some Industrial Shelving to put in my garage. They are easy to build and strong enough to take all my heavy gear. The guys I dealt with were very helpful in assisting me to purchase the right units for my requirements. We are very happy with the service you provided. The value is outstanding and will be buying more in the future as we expand. The product is excellent, as ever. Delivery was at the appointed time and all went smoothly. We are more than happy with the service that we received from start to finish. Very professional and personal! 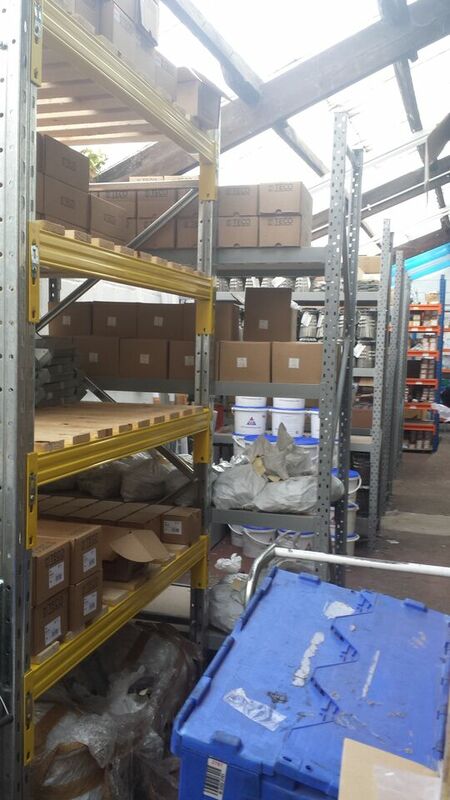 The racking is getting good use and we are finding things much easier in the warehouse now! Thank you all again, it was a pleasure. 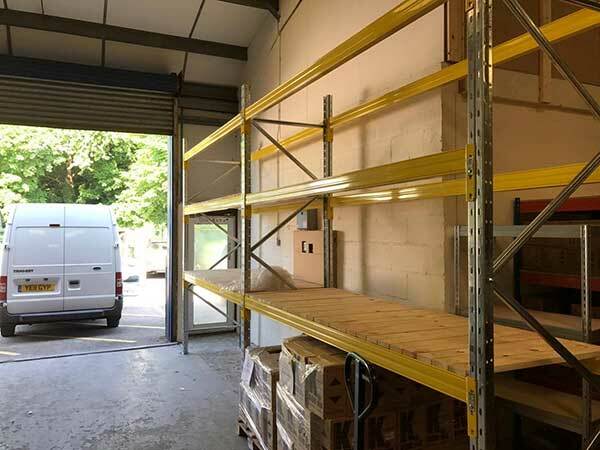 We are pleased with how things have worked out in the end, although we did have some issues with the delivery not being totally complete with two upright frames for the pallet racking being missed off the initial delivery. This delayed full installation of the pallet racking. However, Kevin Carter was very helpful and was able to resolve the issue quickly before the move in due date. 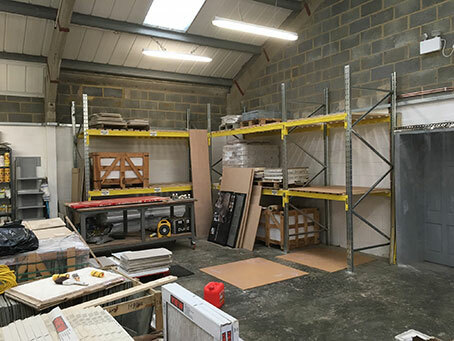 Also your fitters were very helpful in relocating some of the racking when they returned to the site as the aisle width initially installed did not prove to be wide enough. Work that was carried out efficiently to accommodate our wishes. 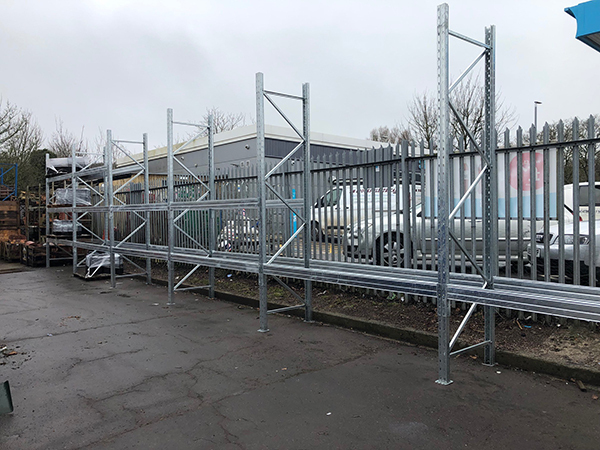 We still have one slight issue outstanding as with regard to the low level longspan racking again there was a slight mix up on the order, we ordered some 1.8 metre racking and we received 2.1 metres so we are awaiting delivery of the 3 x 1.8 metre shelves and 6 x 1.8 metre beams. Kevin informed me last week that these should be delivered here sometime today. All in all we would not hesitate to use your Company again for any future requirements. 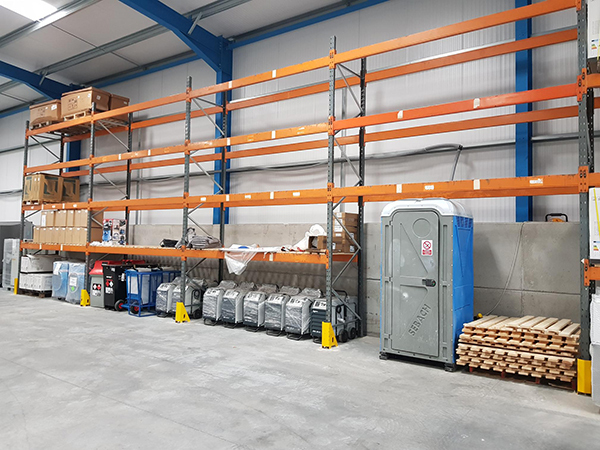 Latest order of racking is now in place, really pleased with how this addition has increased our useable storage space. We were very pleased with the service, thank you. Very happy with the service, all questions answered quickly. Impressed with the quality of the product. 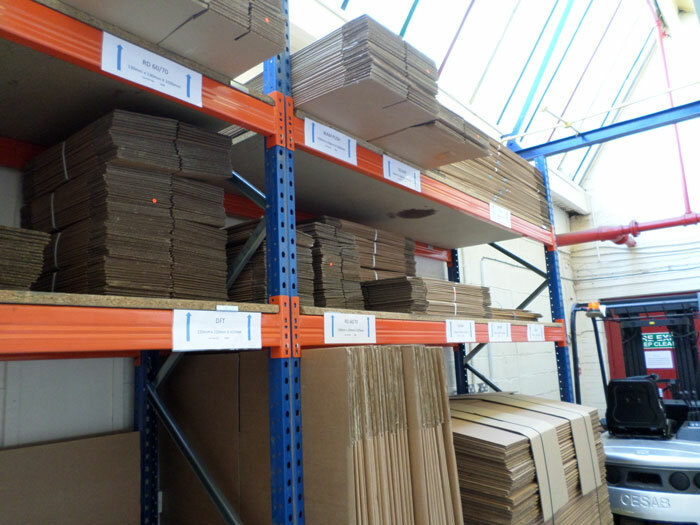 Excellent quality racking, very sturdy. The young lady I purchased it from was extremely helpful. Delivery was quick and the driver very helpful too. Many thanks. Will use you guys again. It matches the last racking we purchased from you a treat. I will be dealing with you again soon I hope. Happy with the service and the racking. The racking you supplied was just what we needed. 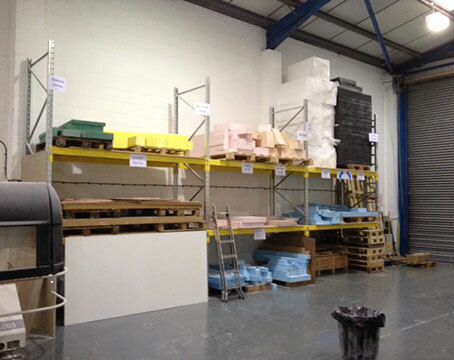 Should we require any further Shelving / Racking I won't hesitate to contact you. We have repeated last years order as we have found the quality, price and look very good. From our initial enquiry over the phone to discuss our requirements it was handled professionally and with expert knowledge. All items arrived on time as discussed. Would recommend this company to anyone who has the need for shelving. Very happy with the quality of the racking and the service. There is a good chance of repeat order on the back of this. 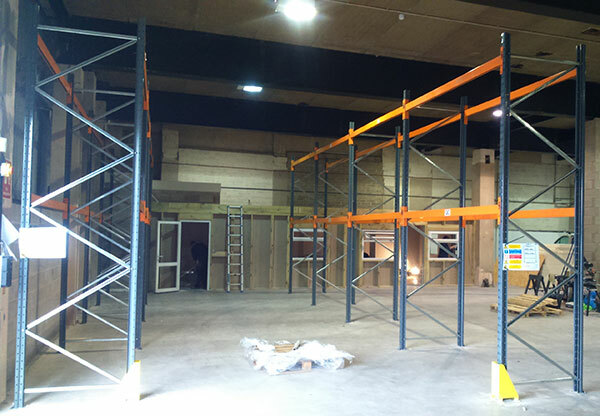 We were very pleased with the racking supplied by you. 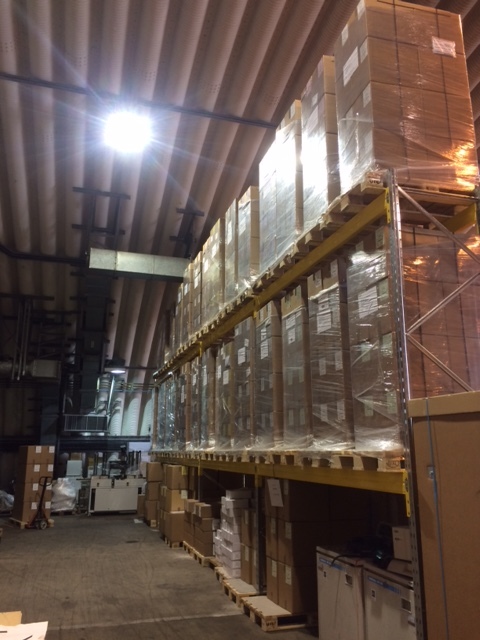 Pallet racking arrived on time and yes we are happy with our purchase. 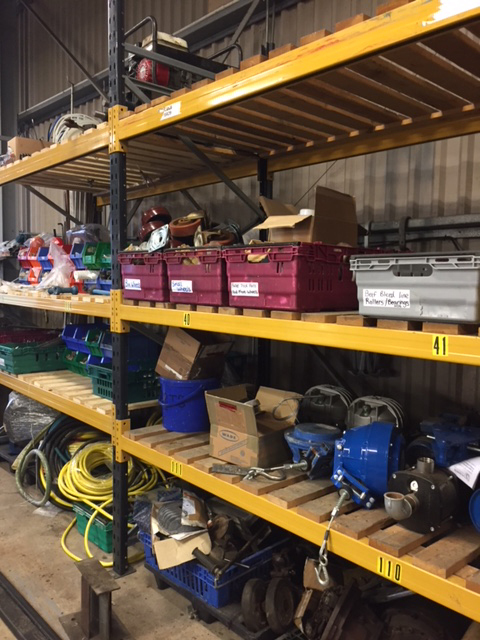 We will always come to you first should we require any further racking or assistance. 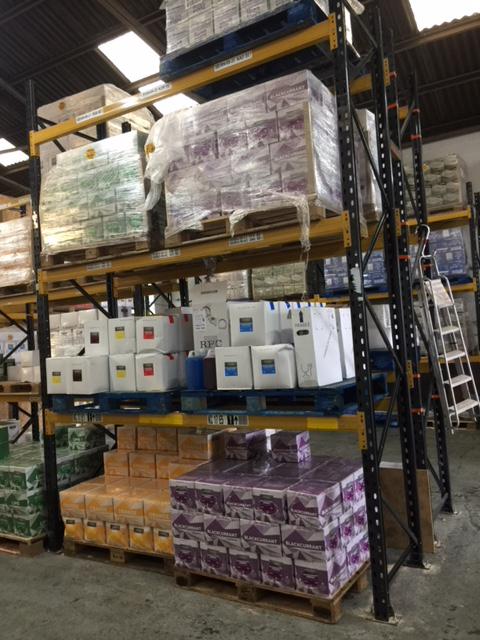 We are very happy with the pallet racking we ordered as you can see from the attached picture it is already filling up with stock. Considering it is a used product the quality is first class. 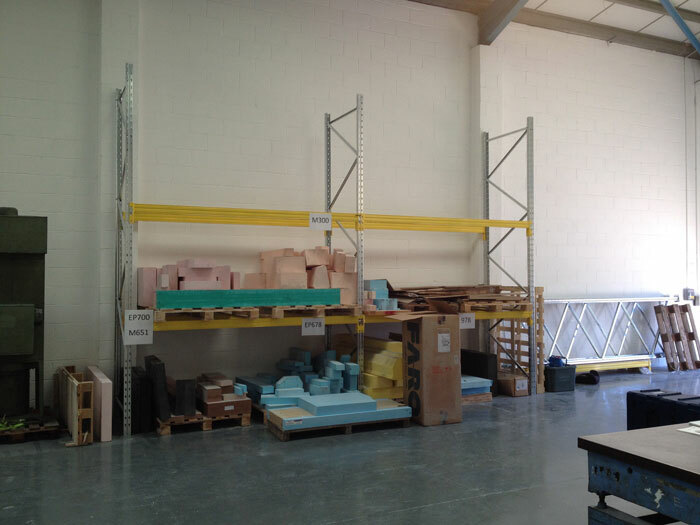 Will definitely be using you again and recommending you to any of our customers who need similar racking. From the point of contact to order and delivery, I found the experience to be fast and professional and the product delivered of good quality with a very keen price, we will use again in the future. Order was all okay. Thank you for the help on it. 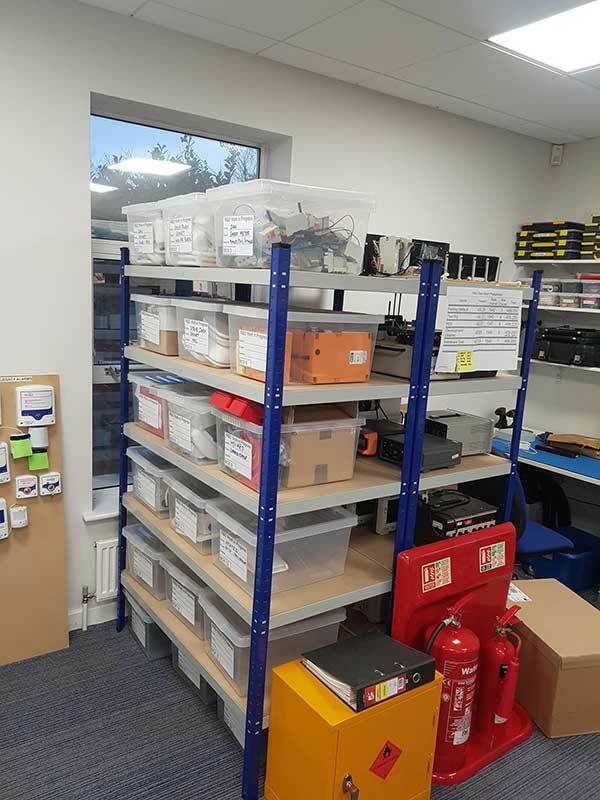 We find your system very useful in some of our builds where our clients need stock room shelving without digging too deep into their pockets. I know there will be more of this system needed later in the year. Will keep you in mind. Dealt with Andy I think it was and service was good. I have used this company 3 times now, they are very quick at delivering, and the price is very competitive the service also very good, I will use them again. I am delighted with the shelving and the speed with which it was delivered. Works a treat, good value for money and delivered in good time, my storemen are happy and it's Friday!! Couldn't ask for more. Very pleased with the quality of Racking and the customer service - will use you again. We are very pleased with the products & speed of your services. It has been a pleasure to do business with you & we will no doubt be ordering again very soon. Very pleased with all aspects, from advice to delivery! Will be ordering several more sections within next few weeks. The racking we have received is of in my opinion ‘high quality’ and really looks the part in our new garage. Cant thank Peter enough for his knowledge and professionalism. Will and are using you again for our work benches. 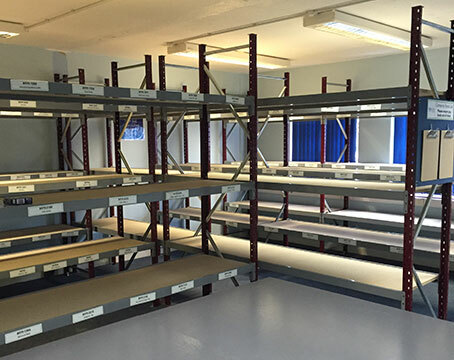 We are very happy with the service and the quality of the racking supplied. Would recommend to anyone. Everything was very good, price and service including installation. Easy to assemble, great finishing on the racks and very helpful when I rang in and asked for a soft copy of the set up guide that someone swiftly sent it to me to help us set up. A good product, easy to understand web site, very competent and knowledgeable staff on the phone. Delivery carried out by your own transport driver phoned and informed when half an hour from address and found it despite being in the middle of nowhere. Service was great, no issues whatsoever. As far as I’m aware everything was fine. Racking is in and looking good, thank you. Sorry photo is not that good but there is not enough space to obtain good view. To be honest I can't think of anything you could have done better. Your competitors that I came across are all have absolutely shocking customer service and yours was the opposite. I appreciated the speed you responded to me the most. The only thing I can suggest is promoting to your customers that you have a really quick response time because I had almost given up hope in contacting people. I don't need the incentives to give you my feedback, nor to return for future purchases if I can and have the need. 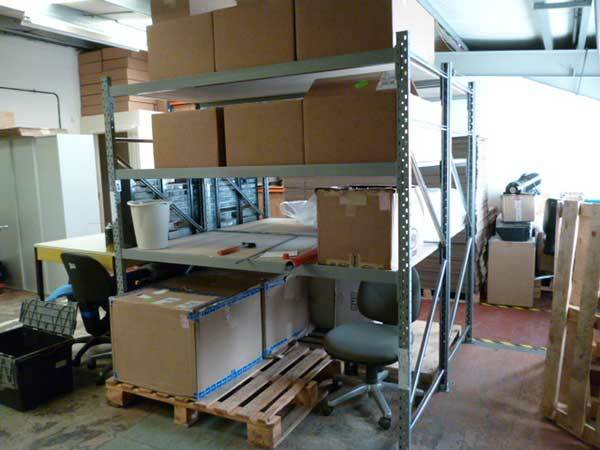 You are a warm and welcoming company, and the service and shelving are excellent and affordable. 100% happy with the service and quality of racking. The racking was delivered on time as promised. It is erected and we are very happy with it . All round great service and price. What more can you ask for.. The canteen manager was over the moon with the results. Once again if I need to purchase any further racking you will be the first company to be contacted as you have provided a good product and delivery service. I was not here when the racking arrived last week but I have received no complaints so I guess all was okay with the delivery. Thank you for your offer of one Tape Measure which we gratefully accept. We are very happy with the service and quality of your product and have this morning placed another order. 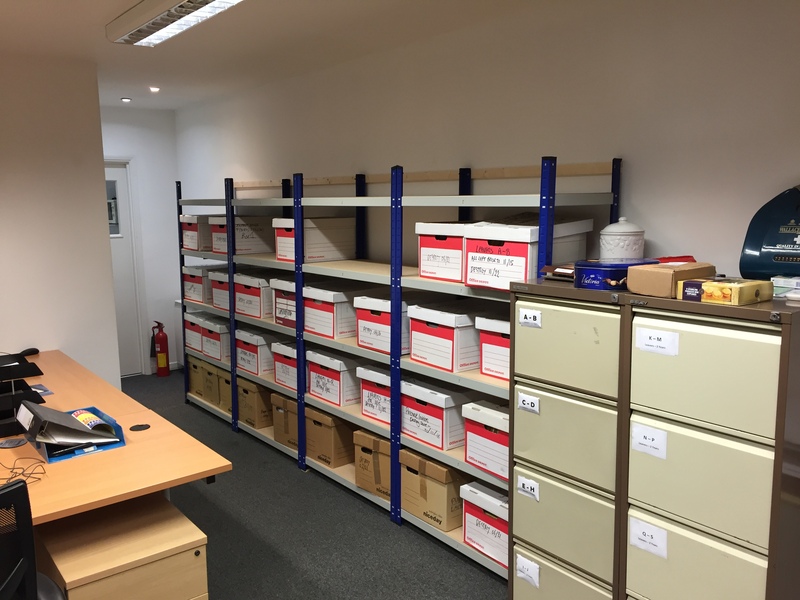 We are delighted with the shelving, it’s exactly what we asked for and perfect for our needs. 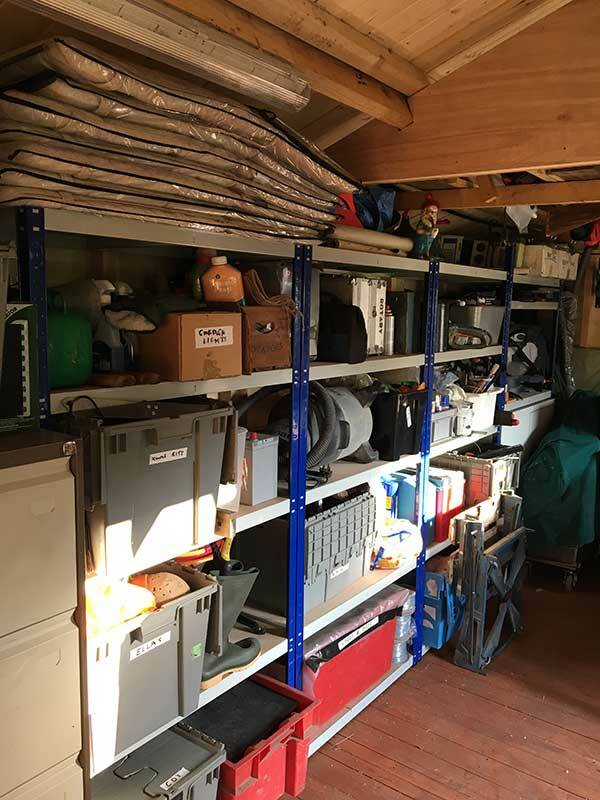 The standard of service was excellent, from the initial visit by Dave Colley through to the installation itself which was carried out efficiently with little upheaval. Thank you to all involved. 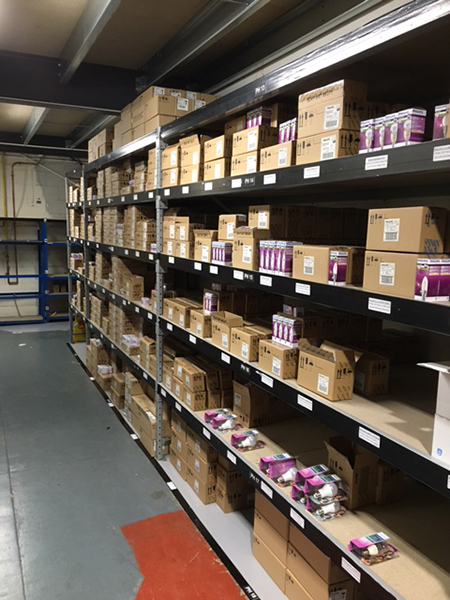 Thank you for the supply of the link 51 racking to extend and repair our racking. Dealing with your company was very efficient and effective. Your knowledge of the product was helpful in identifying what we required and the order delivery process was fast and efficient. Thank you for the recent racking installation. 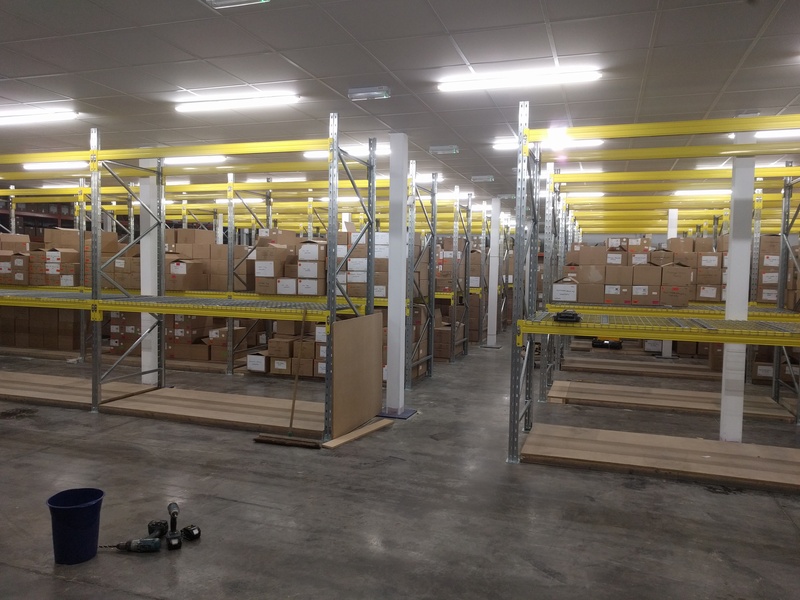 We are very pleased with the racking and service provided. 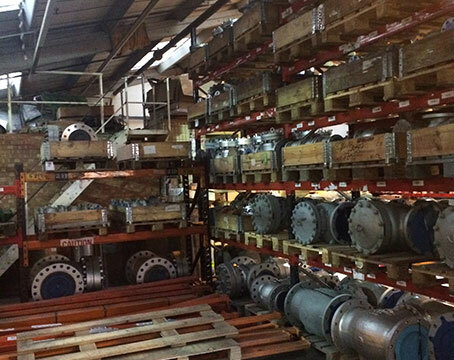 Please see pictures of the assembled racking in our warehouse. 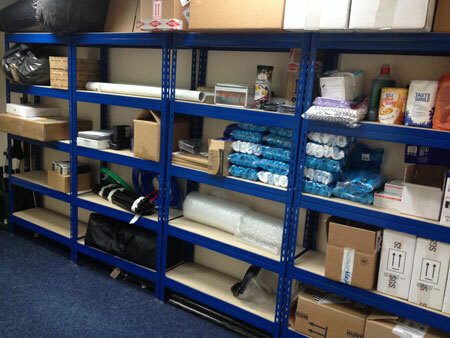 We are very pleased with our shelving and would recommend you to other departments in our business. The feedback I have is that the whole experience was awesome - great technical advice and an easy process. We'll probably be ordering more soon. As you can see we are already making good use of the Rack. The Level of service was good, we got what we wanted when we wanted it. I spoke to the guys who put it together and they told me the rack went together well. Very happy thank you and we shall be ordering more! I don’t usually ever respond to these type of emails but as I was so impressed with the service and the racking you supplied us I felt I should. 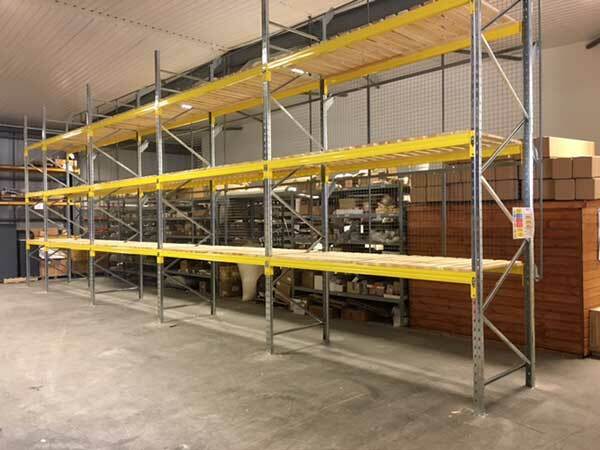 The racking is of great quality even for something which is second hand! And was delivered on time also. Should we need more racking, which will probably will I shall be in touch. Please don’t worry about the tape measure we are a Set building company so have them coming out of our ears! Please pass on my thanks and look forward to working with you in the future. We are currently removing all our old racking and replacing it with new. The service we are receiving from you is excellent and I'm sure once we are up to date with these racks we will be back for more. Just wanted to say a massive thank you to you guys for the service and product you supplied! I called for a quote, the lady could not of been more helpful, within half an hour I submitted my order, immediately got an email with a proforma, got that paid, and received a confirmation within minutes. A lovely gentleman called on the Friday afternoon to let me know my order had been loaded onto its transport and would be with me Monday, brilliant service in my eyes, once arrived it actually only took one guy to put together, the product is so sturdy,clean and tidy and perfect for purpose. Will defiantly be using you guys for any other shelving we may need in the future! Please see attached photos, still have some organising to do on my office shelving but everything else is brilliant. 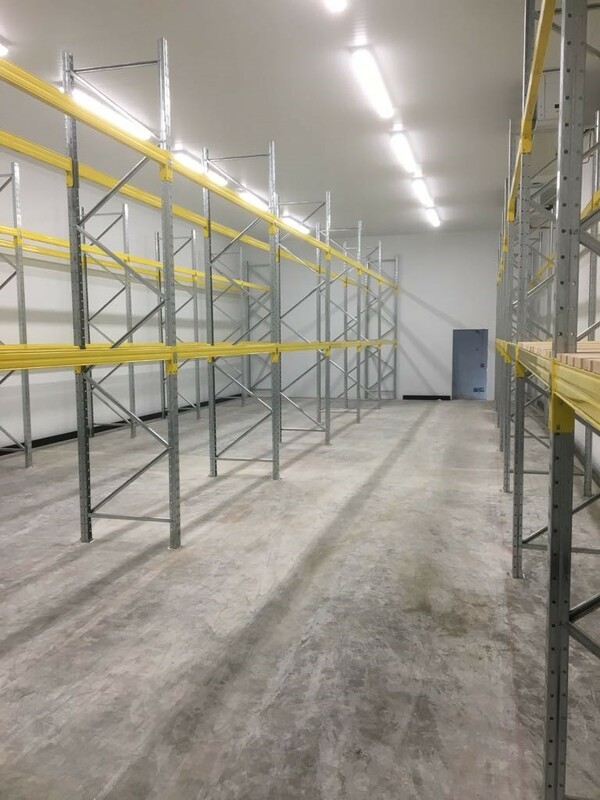 We are more than happy with the racking and the team that installed it. We dealt with Kevin for the most recent installation. The quotation was received promptly and installation arranged for the day we requested. In all, very happy. 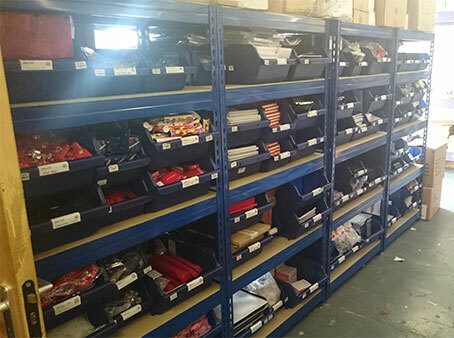 Great cost, great service and quality of the racking was superb. All now installed at our new premises. Thank you. The product is easy to erect versatile and sturdy as can be seen from the pictures. 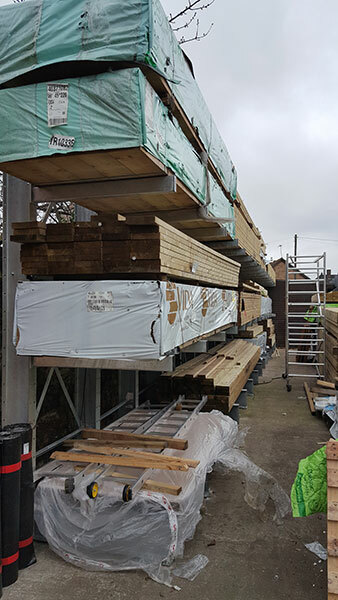 Thank you very much for the racking supplied to us, the service I received was excellent and Paul was very helpful and prompt with the quotations. He was also very helpful in amending our order to allow us to collect it from your depot so we could meet our client’s needs. I will definitely be using you again if and when our client requires more racking. 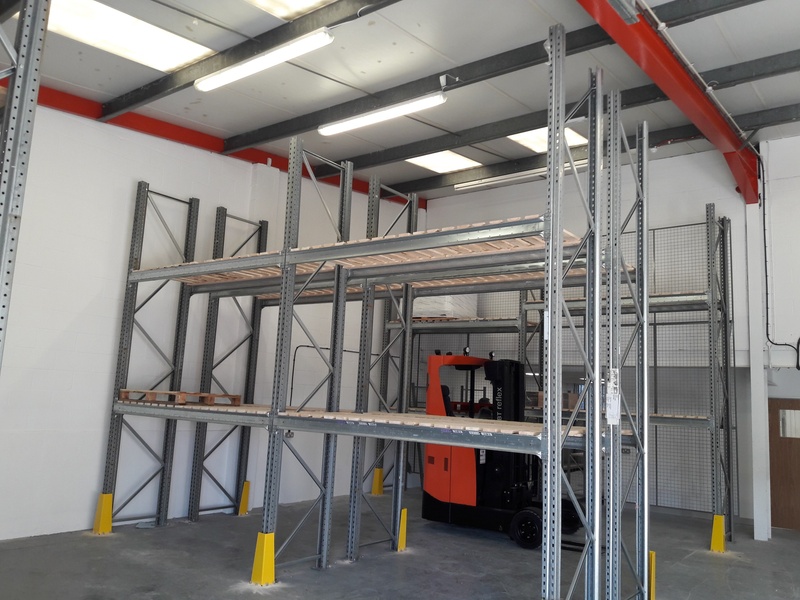 Our engineers said it was much easier to assemble than other racking systems we have had. Please see the attached photos, sorry about the quality these are what our engineers took. Many thanks for the great service. The shelving went up the day after it arrived. Unfortunately we have a lot of tidying up still to do. See attached the shelving. I've got a way to go to make it great, however your easy assemble racks really helped. Sorry for the delay, been really busy here. Your help was invaluable, and we couldn't have managed the job without your input. Thanks again for sorting this job out of us, as it wasn't an easy one. Extremely happy with the racking and the service provided. Prompt shipping and arrives exactly as agreed. Please see pic attached. Great price - great quality! 3rd Purchase of this Racking from The Used Racking Company. Fantastic product and excellent value for money backed up by 1st Class customer service. All good thanks. Arrived nice and early and occupied an evening of construction. Now all in use. The racking you have provided as been exactly what we expected. We have been extremely please with all aspects of dealing with your company. 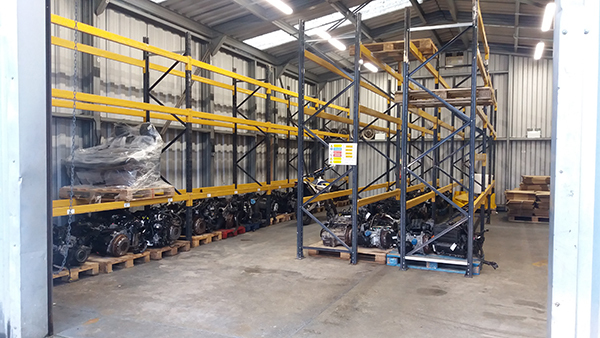 Every Car Covered always use The Used Racking Company for its racking needs, an exceptional quality product at the right price with a great customer service, why go else where. 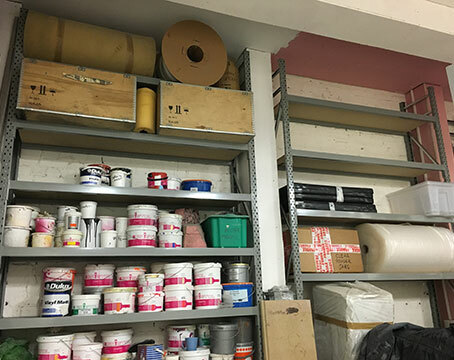 I know im a very small customer, but I really appreciate the customer service you have provided, and the quality of the shelving / bays is excellent. 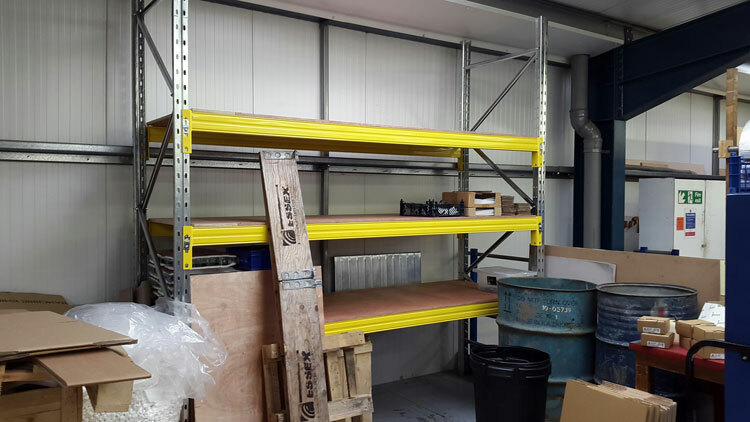 We were very happy with our used racking and it was delivered quicker than we expected! 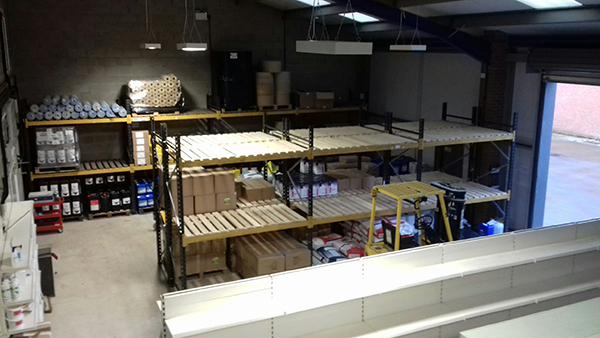 The racking is now up and in use. Many Thanks for getting back to us. 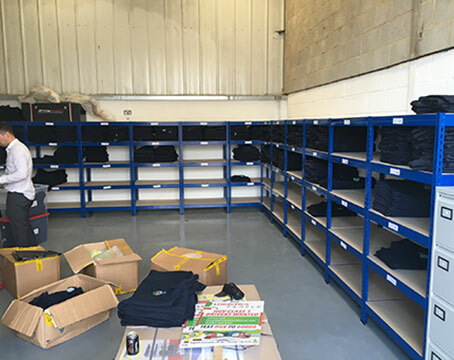 We we're looking for a company close by to Uxbridge who would be able to supply us with a racking system quickly and efficiently. You gave a very detailed breakdown of the size options which one of our departments needed specifically for. Quotations were done promptly and within the same day; even when modifications had to be made which is what we needed in order to get through our accounting procedure. 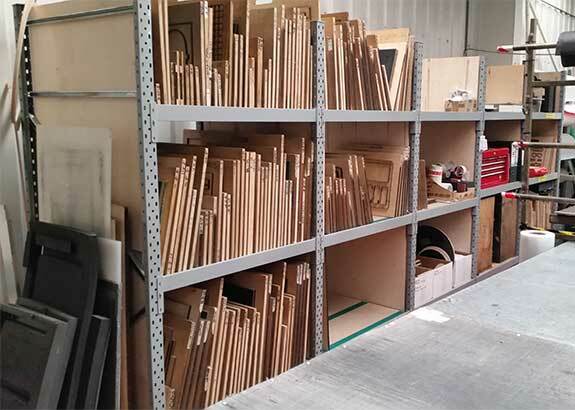 Collection went without a hitch and the gentlemen in the department who requested the racking were very pleased with the material and build quality of the frames and the chipboard. I just wanted to say thank you for the excellent service and quality of products we have received from your company. Both the delivery driver and the installers were polite, clean and tidy and were a credit to your company too. I would have no hesitation in recommending you to any other business. Service was great, delivery swift and product is, as ever, ideal for our needs thanks! Have attached pictures – I am always borrowing next door’s tape measure so an ideal gift thanks! We had it all up and done in a couple of hours. Great service received from your company. Goods arrived and it was really well packed and stacked on receipt. Very impressed with the service. 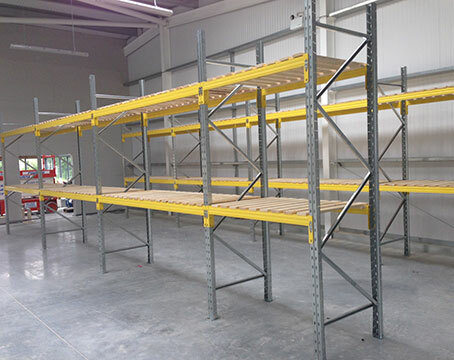 The Used Racking Company provided a competent service from start to finish. Communication channels in the company are very streamlined so there was no time wasted between different phases of the project; site visit to design to installation. 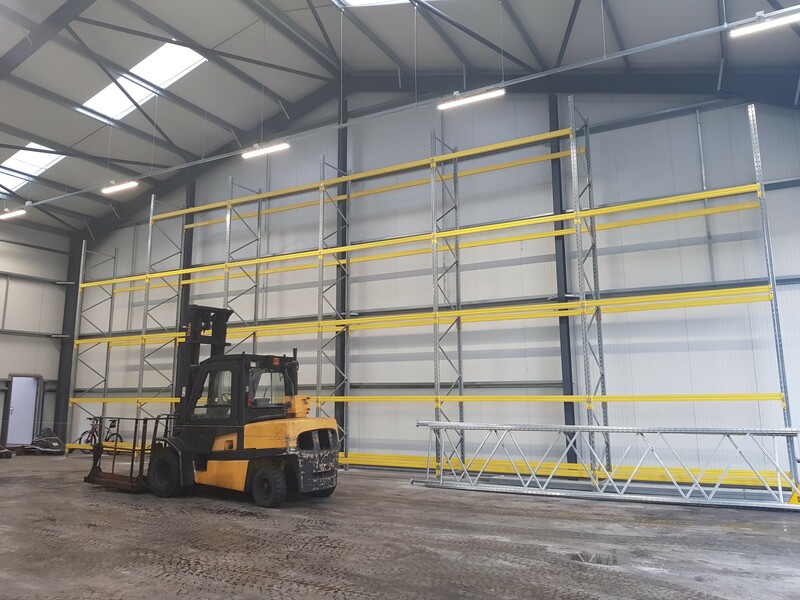 Our company changed the brief a couple of times prior to The Used Racking Company being chosen as the successful company and I found them very flexible and totally professional to deal with. 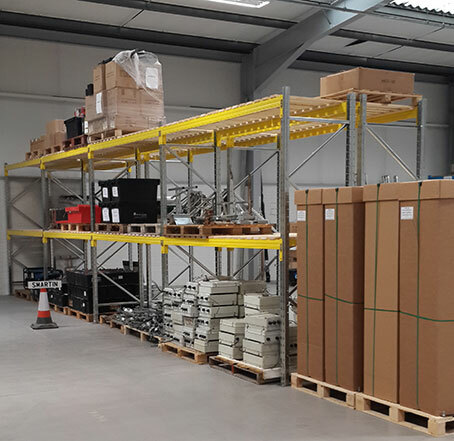 The installation was organised and well manned, and we actually got the warehouse racked ahead of schedule. I would recommend this company any day of the week. Photos of our installation, Very pleased with the product and service. Absolutely delighted with the quality and the ideal for what we require. Just finished installing racking, all looking good. The racking fits nicely thanks. Really easy to put together, very strong. Exactly what I wanted. 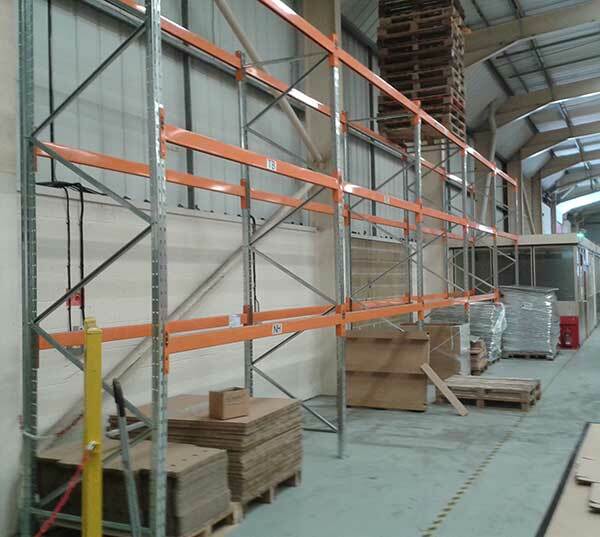 Please find the new shelving units installed in our new Derby depot. 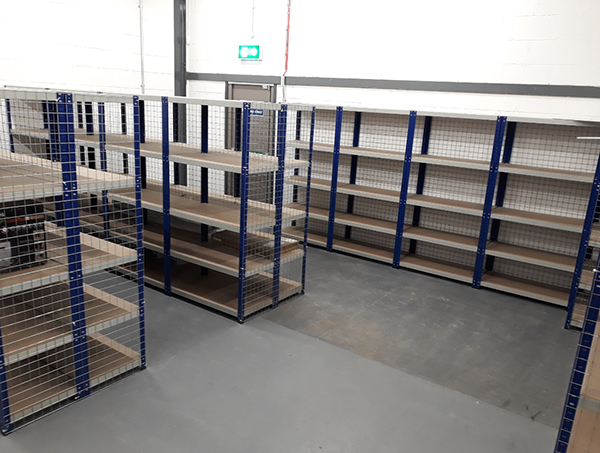 Great racking, very quick and peter Hough was a pleasure to deal with Pictures are of the racking half finished currently, but work in progress! I would like to thank you for your excellent service, not only yourselves but the fitters who completed the job. 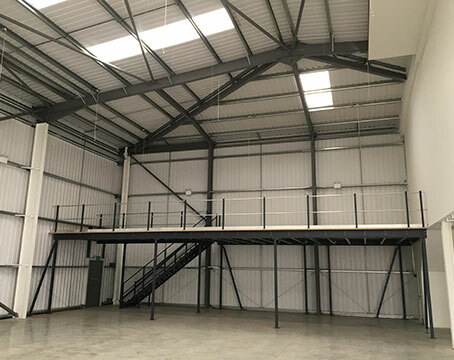 Not only top class installation, but also their willingness to work with us to get the most out of the space available. Just to say your help and service has been excellent each time we have used you. And the product is fit for purpose and looks great. 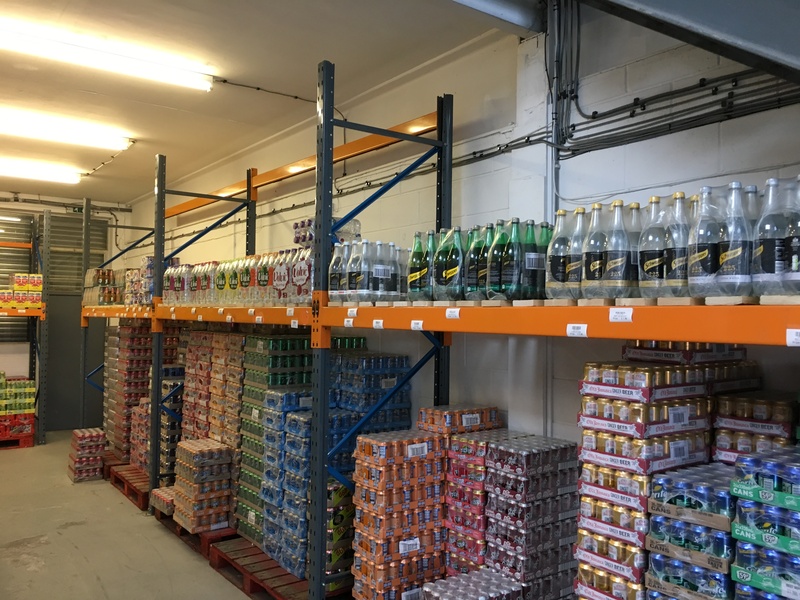 I can confirm that we are very happy with the new racking that was installed and the service that was provided by Andy Coldwell was first class. We have just purchased some decking for the value of £900.00 does this mean that we will get the free golf umbrella?. Perfect tank you everything is better than expected and all up and running. Will definitely order again. Yes we have received and all great thanks. Fast delivery, easy to install and colour matches our new factory. The speed of delivery and the quality of the product were both excellent. I would not hesitate to recommend you and buy from you again. All arrived thanks and put to good use! 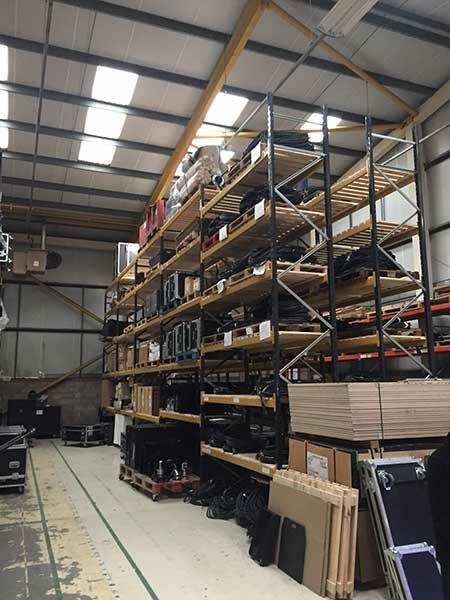 Many thanks for all your advice and expertise in helping us to select a set of racking for our factory unit. 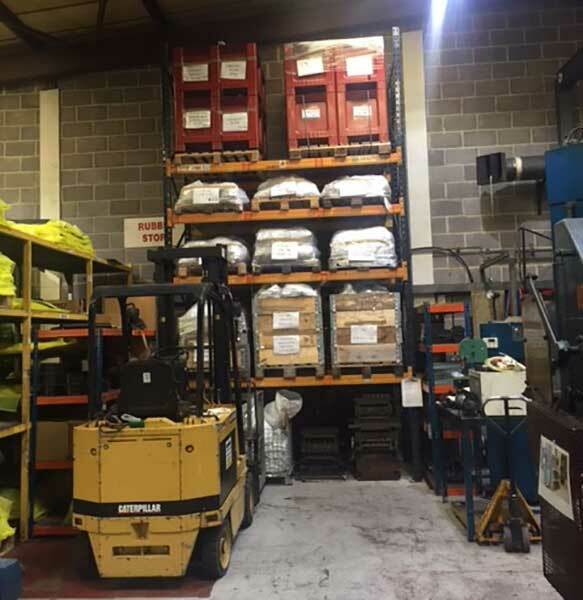 It arrived promptly and in excellent condition, we are very pleased with the service we have received from you and will definitely call on you again in the future for our pallet racking needs. 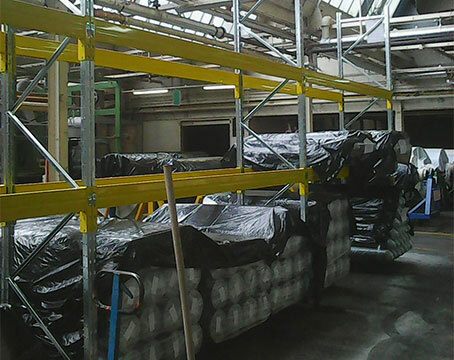 Once again many thanks and I have attached a photo of the racking in situe. We are, as always, delighted with how we are looked after by you wonderful folk. If you could just halve your prices, it would be perfect! I've attached some pictures of the racking in situ. I was pleased with delivery time and the quality of the racking. The only issue I had was that no pins were sent with the racking. Fortunately I had spares on site so was able to make it work. Racking was a good price and for what we needed it's very cost effective. 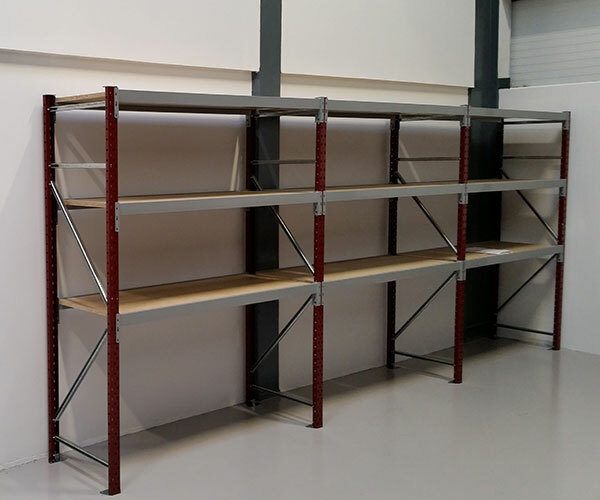 Our Company below recently bought some longspan shelving from yourselves. 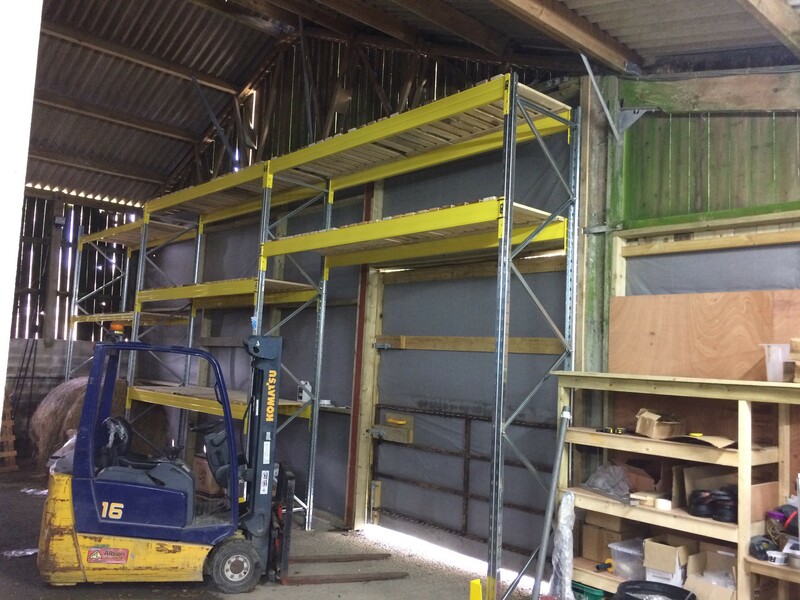 The shelving was extremely easy to put together and the shelving although fairly high was solid in construction. It should last for years and serves our purpose well. Many thanks for the racking we are very happy with it. 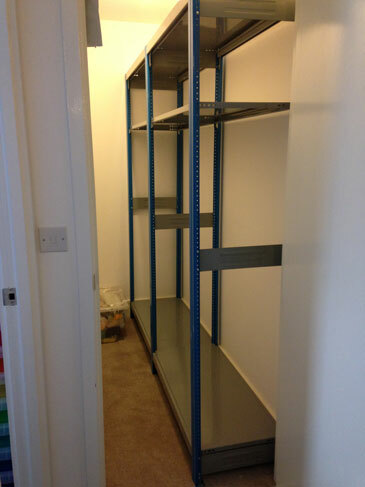 I have just sent some images of our racking to go alongside my feedback. The process worked generally well. Kevin was very helpful and organised the process effectively. The guys turned up on time, they were polite and quick. Very impressed. 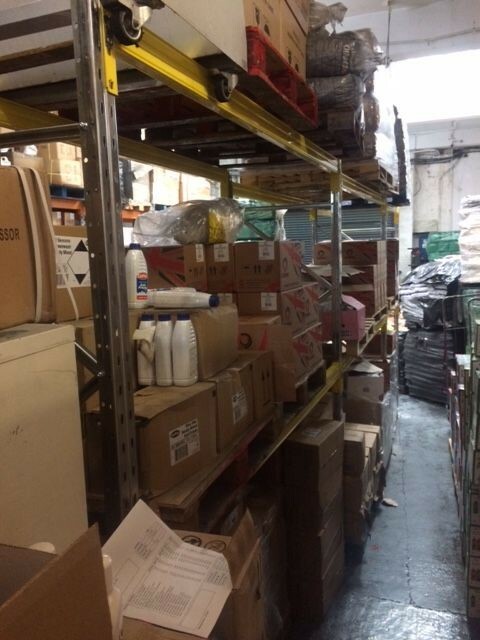 The only problem was that the initial delivery from the warehouse arrived too late and your team had to reschedule. I would recommend the Used Racking Company. 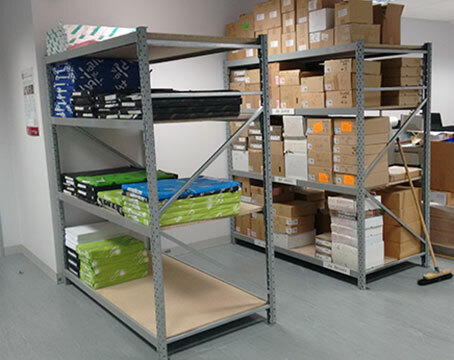 Thank you very much, the shelving arrived safely and is now erected and doing a great job. Thanks you for your help today and a very efficient service. 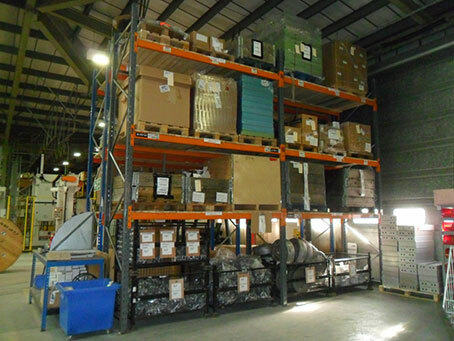 Please find attached a photo of our new pallet racking. It was delivered on time and has been very easy to construct. Thanks for a great service. Happy Christmas. 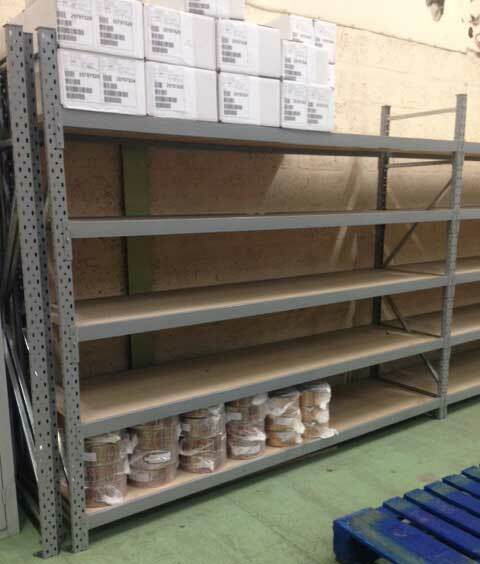 Very pleased with the longspan Shelving, we will always come back to you if we need any more thank you. You exceeded expectations. Your driver arrived promptly as agreed, was extremely helpful unloading. 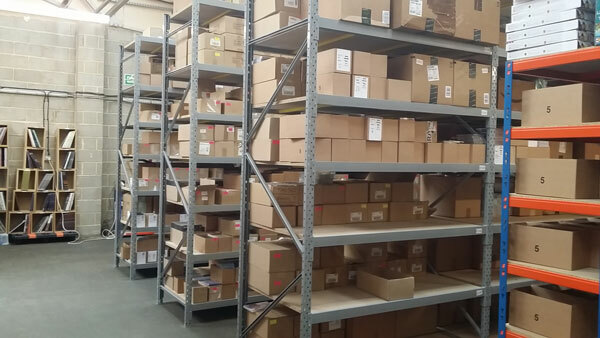 As we were expecting used racking and received new, the product quality exceeded our, and our clients, expectations. 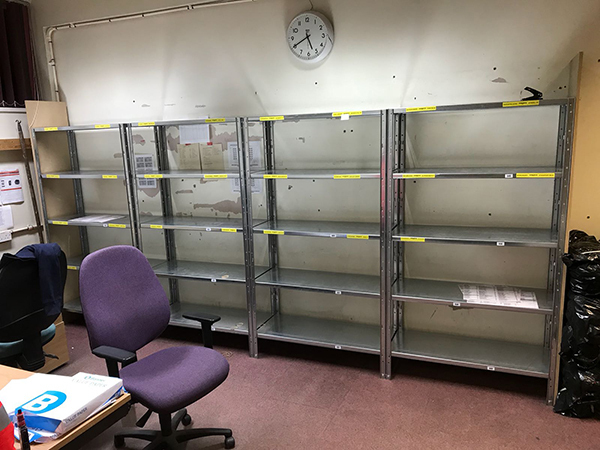 We have received the shelving, thank you. I have to say what an efficient service. When I called about my enquiry, the assistance was excellent from the ordering to the delivery with in 48 hours. 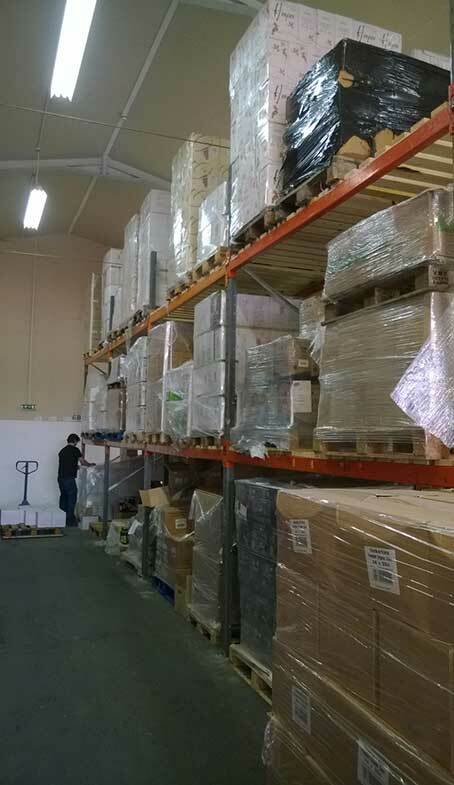 The pallet racking was brilliant quality. 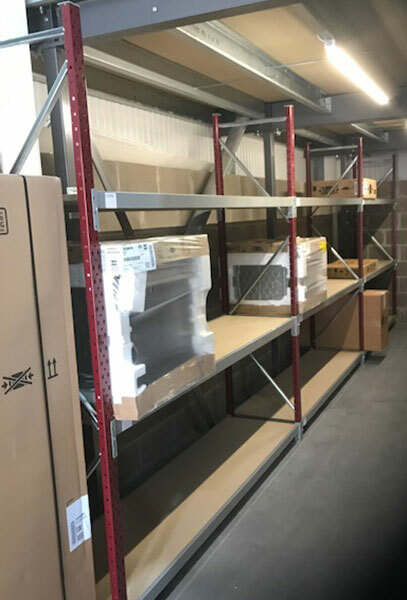 Excellent quality used racking at an unbeatable price combined with super fast and efficient installation – 10 bays in less than a morning! Racking has all been delivered and looks great, really pleased with the service and quality. 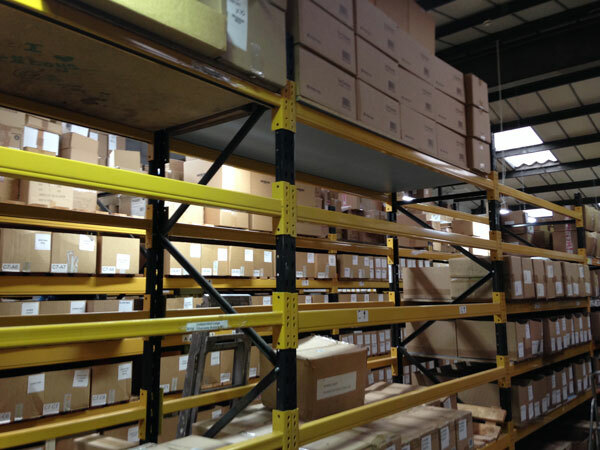 Yes we are very pleased with the racking, and will buy again through you when we need more. Thanks for your email and thanks for the service you have provided. 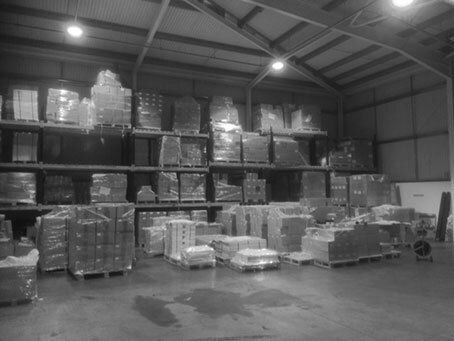 The products arrived as planned, and were all in excellent condition, we ordered 15 bays and have installed all but one. The service from first call to final contact was professional, informative and very helpful throughout. I am very pleased with the service and racking supplied by yourselves. But as you have contacted me i will give you a few moments. I must say i was very impressed with the speedy service, emails etc and information i needed to make my purchase. I have always used your company for all my storage requirements and will carry on into the future. The smaller racking we purchased was spot on for what we needed it for, nice quality, strong and very functional....very happy. Thanks again and as soon as we need more storage i will be in touch. Its been great customer service especially the way it was handled the replacement of my wrong order. Really appreciate - we strongly recommend this company for any growing company. I'm planning to make a use again with my further expansion. Will wait for your free 8 metre tape measure. The racking is great thanks, very pleased. 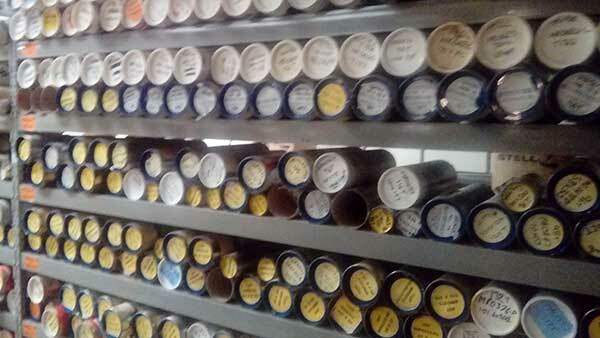 The quality of the product received Racking was received and installed on the date requested and with ease. 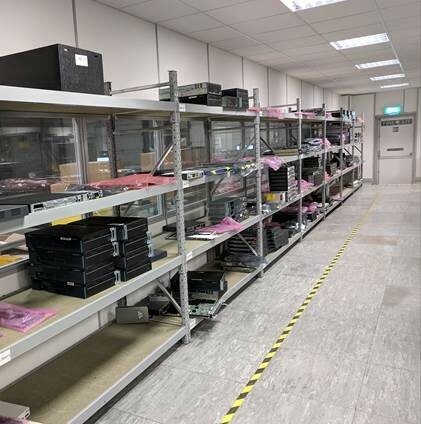 Our client is very happy with the solution provided and we plan to use HCSS if we ever have a requirement for racking again. 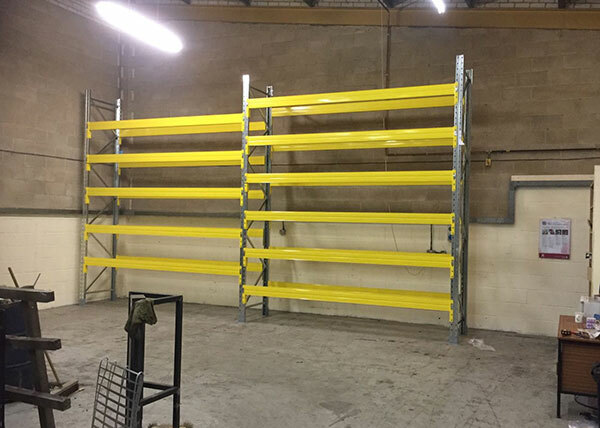 The overall service level received from The Used Racking Company. Faultless service, responding to calls or emails quickly with advice or quotes following receipt of our plans. Thanks very much, very happy with the racking! 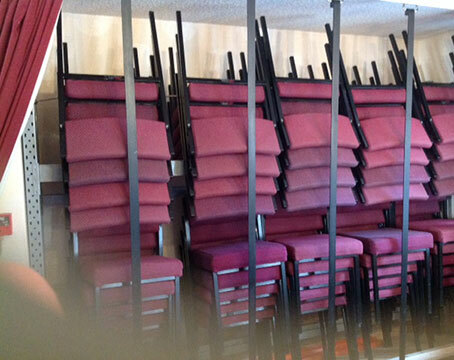 I thought you may be interested in what the racking we purchased from you was used for, We had a large number of dining chairs which are used on only three occasions a year and were stacked on the floor taking up a large space to one end of the bar area spoiling the overall effectiveness of the bar, I ordered a 2.7 m X 500mm two shelved to fit in a 600mm deep recess which arrived very quickly and efficiently by your contractor, What I had not realised was that was the size Between uprights ! Not as I thought the overall width, As we put the rack together we realised we might have a problems with it being too wide to fit the recess, we had to remove the floor fixing plates from the uprights , it then fit that snug you could not get a piece of paper between the uprights and the wall ,a better fit you could not get, As my photos show we now store 45 chairs in that small space (if the ceiling had been higher, even more, could have been stored ) We placed the rear parallel bars lower than the front ones to tilt the chairs towards the rear wall so the chairs don't fall off (the vertical bars in front of pictures are safety item) we then had curtains fit so when closed everything is nice and tidy,(we just need to get rid of the old wooden tables in front of pics) Ps we also manage to store surplus tables below bottom shelve, We are well satisfied with your product and the service you provide, Well done!!! Thank you very much the order was delivered very promptly, but as it we are trying to get a new business off the ground we only actually assembled them last weekend. Assembly was very straightforward and I even managed two single handedly! 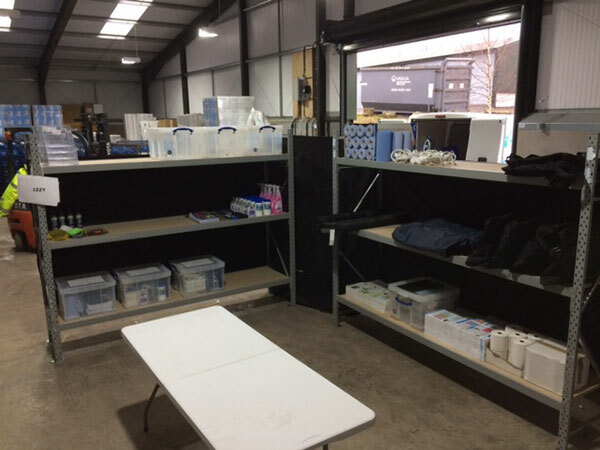 We will be looking for more units to expand our stock area so will be sure to use you again. The racking came early and was assembled quickly, no problems. I amended the quote several times and got a quick response, so all good! 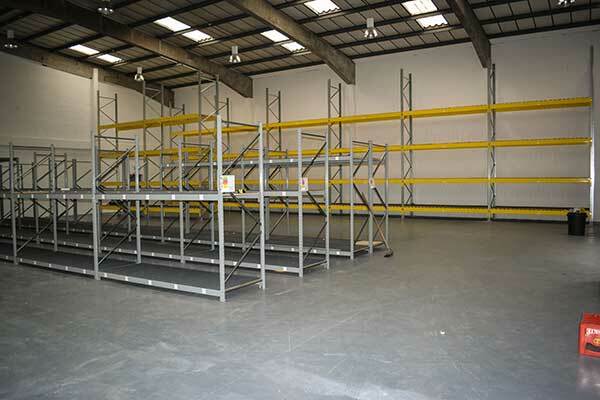 We are very happy with the quality of the racking and overall service from your company. The installation was quick and efficient. Really happy with the shelving, exactly what we were looking for and at a fraction of the cost of similar products online. Delivery and service both exceptional, would definitely use again. 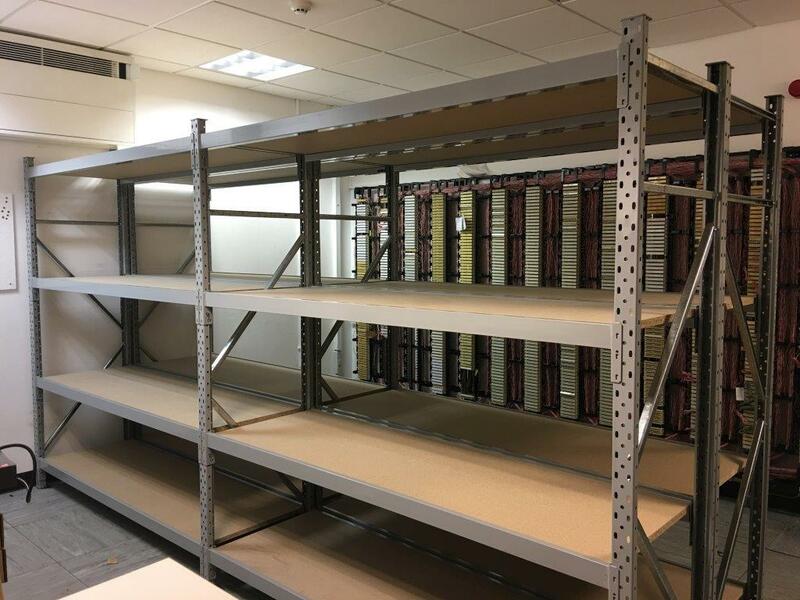 Pictures of your supplied racking. 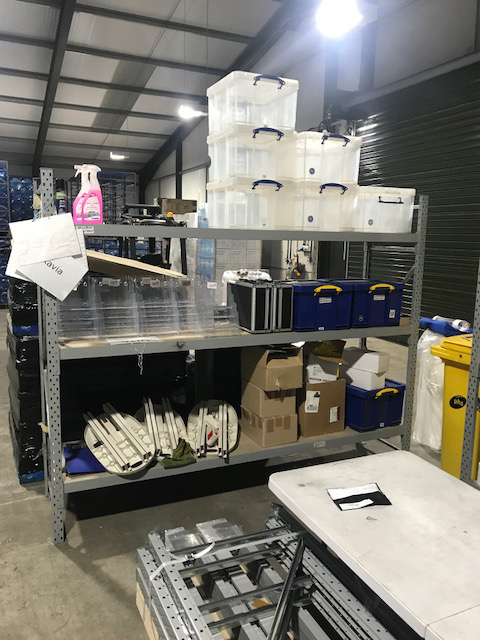 The racking we received from yourselves was nothing short of excellent, as you can see in the attached pictures it has already been put to use. The service and delivery were top notch. This racking has been put in what has been deemed ‘the dungeon’ so it’s not the most impressive picture but please find attached. 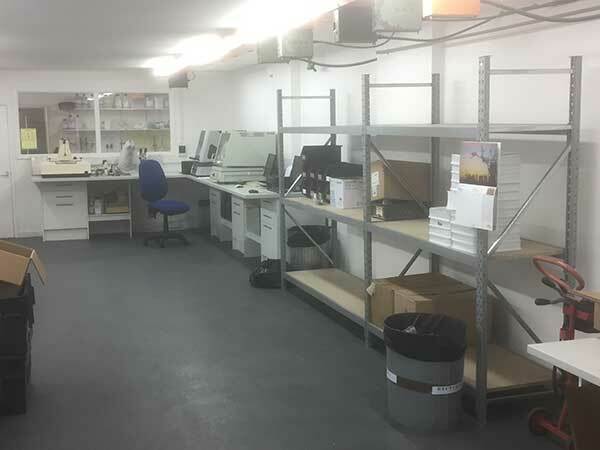 Our shelving is now in situe – however it is in a basement, so the lighting is a little dim! Three pictures are attached. We were very happy with the speed of the service, and they were easy to assemble. Great service – and great price too. 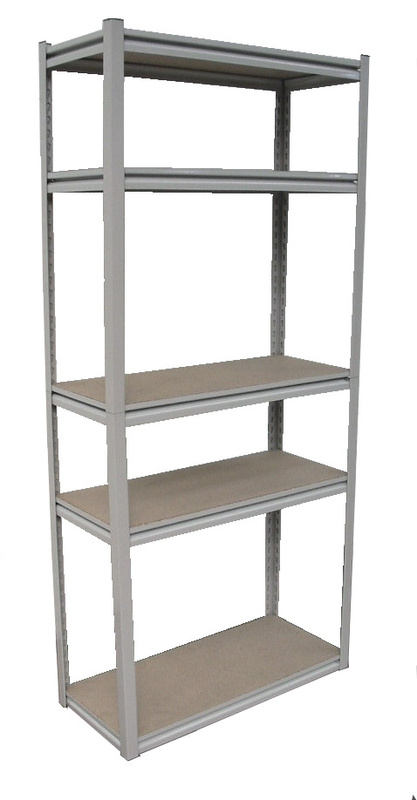 Sturdy shelving & easy to assemble. Absolutely delighted with our purchase, used racking but looks absolutely brand spanking new!! Great service great price quick delivery, we will order more if we need more. Don't have any photos at the moment but can give good feedback about the order. Good shelving and good service. The racking we purchased of you was quality and delivery were excellent. 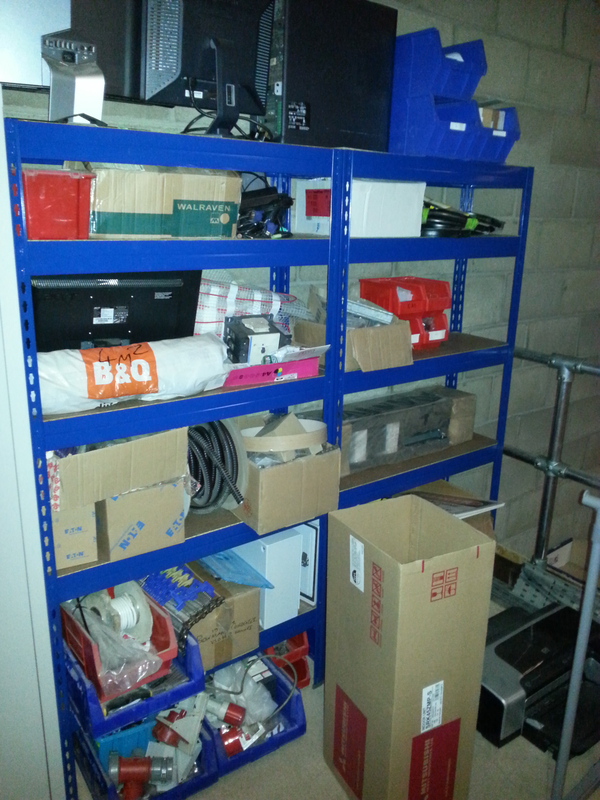 Another purchase from Used Racking, again fast delivery service, competitively priced and professionally installed. 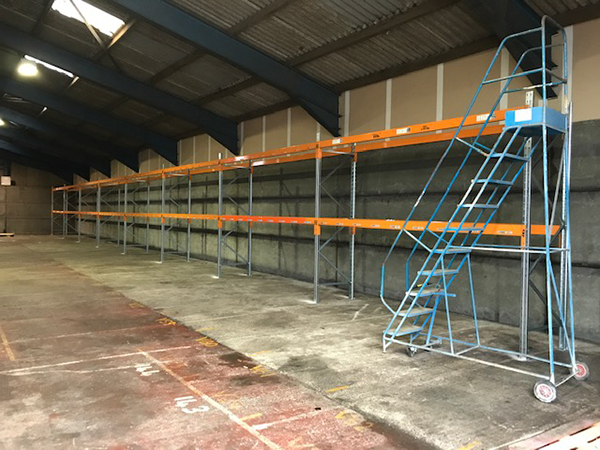 Although a little untidy at the moment due to workload we are absolutely delighted with the purchase of our used racking from The Used Racking Company. The quality was far greater than expected, easy to install and fitted a treat. We cannot recommend them enough. From initial enquiry through to delivery, the process was seamless with the support of Andy Coldwell and all within 7 days! Assembly was very easy, even on the 2.1 meter span it was simple to erect single handed. 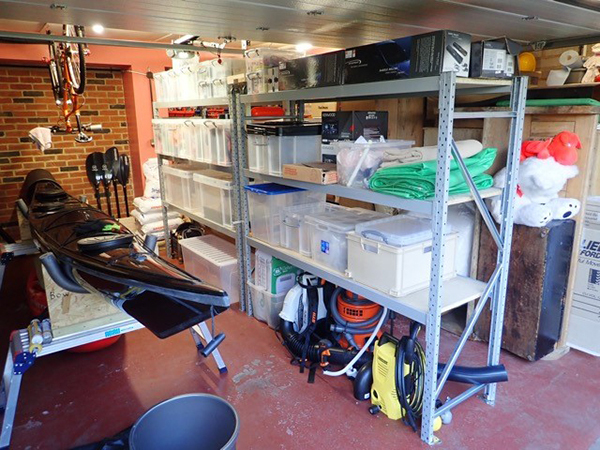 Once up it looked smart and with two rows one behind the other proved ideal for storage of our long thin boxes, end on. 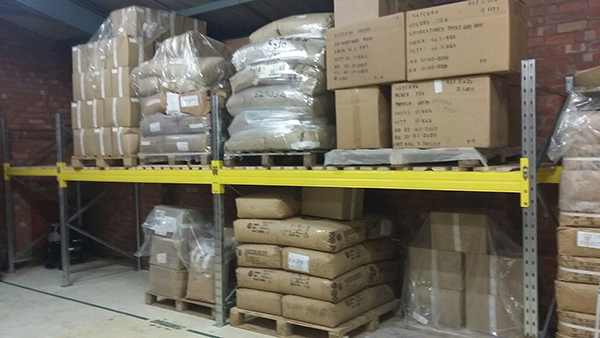 This made a big difference to the way we can now store and access the product for picking and shipping. There were no issues with delivery or order placement, in fact the order turned up a day early, which possible for some would be an issue but as we needed ASAP it was ideal. 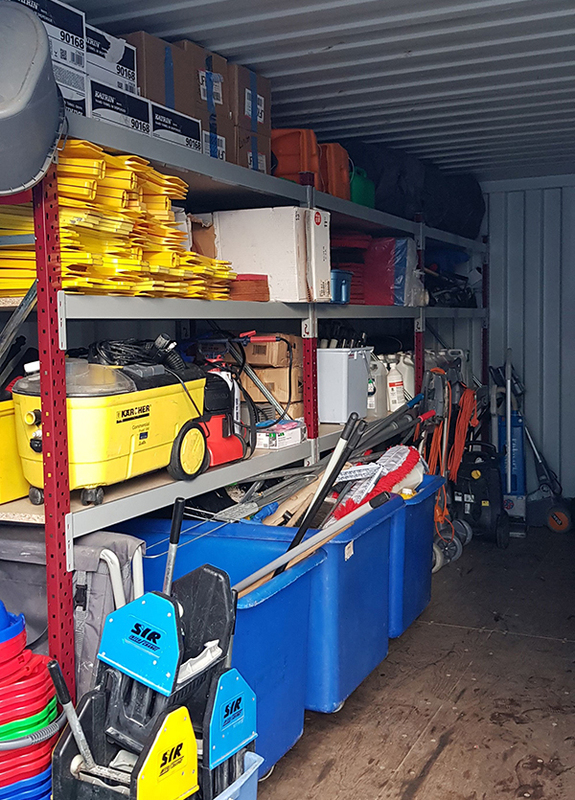 I am a new buyer to racking and shelving and the help and information given over the phone meant I received exactly what I needed, It was very well palatalized and took up a minimum amount of space until erected. 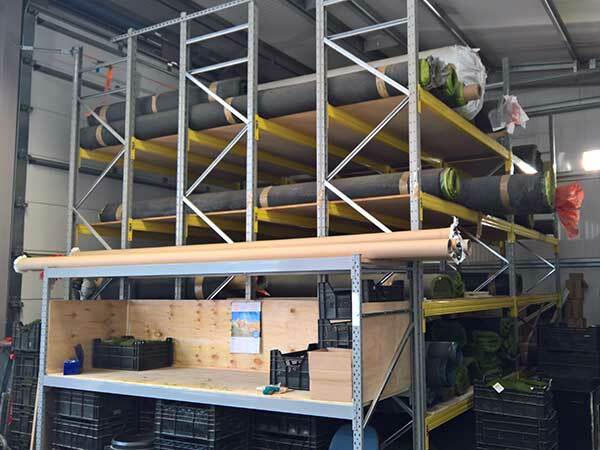 I purchased 3 types of racking and all of them were solid, and extremely easy to erect, I will definitely be using you again, please feel free to paraphrase as I am extremely happy with the products and service. 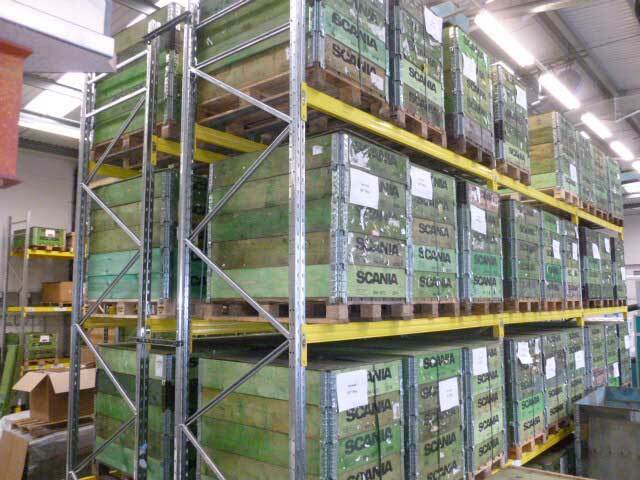 Supplied quickly and fuss free by HCSS to increase the pallet racking capability at Hard Rock Flooring. Would recommend to anyone. 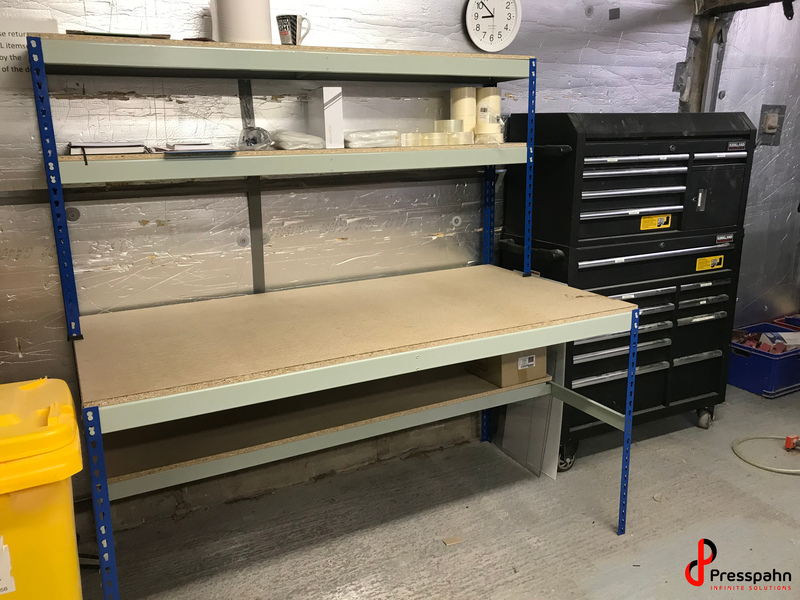 The product we received is in excellent condition and feedback was that it looks more sturdy than the racking we recently purchased from new. 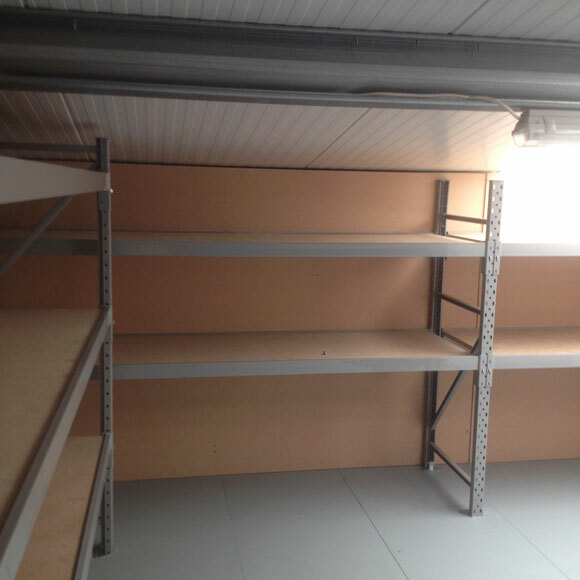 I was extremely pleased with the level of service I received from the Used Racking Company. The staff were knowledgeable, helpful and quick to respond to queries. Many thanks for your help. 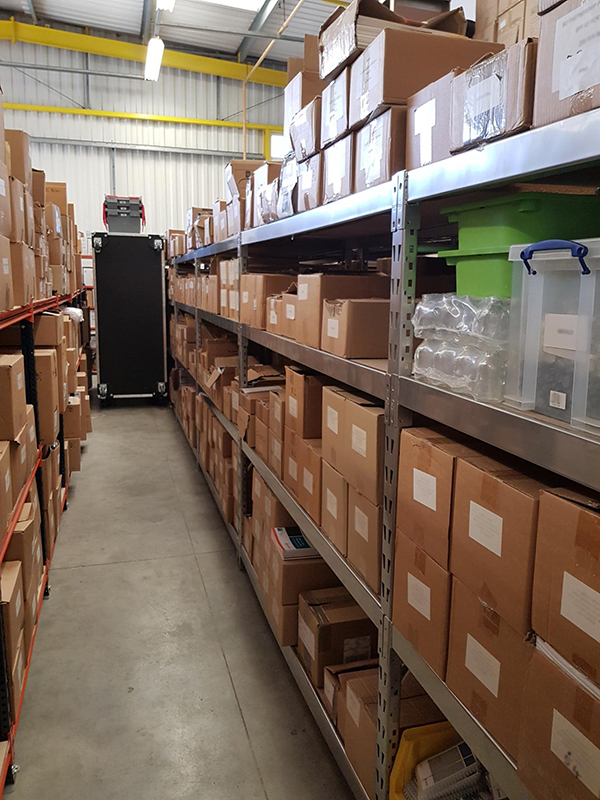 This small amount of racking has had a big impact on the layout, tidiness, and cleanliness of a once neglected area of the factory. 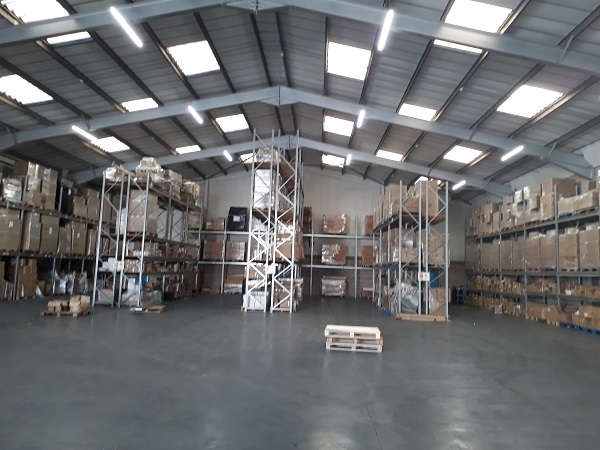 Just like to say thank you for quick turnaround for supplying the racking and the fixture and fittings that we asked for, all put up very easy and bolted to floor see pictures above. This is the second time we have brought from you and sure will use you again. I can add we are extremely happy with the service we have received especially with how quickly you delivered the second order. The quality of the product is perfect and in some cases it looks like new. 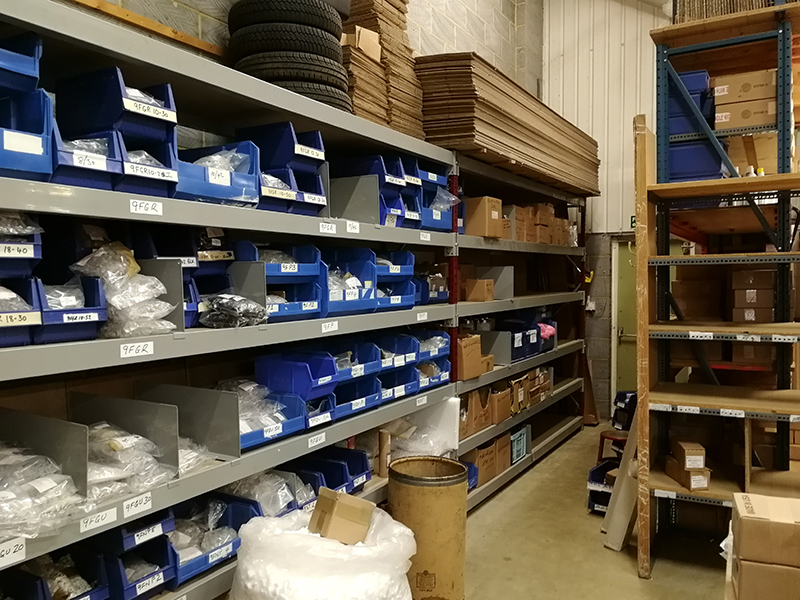 We shall certainly be purchasing any more racking we need from "The Used Racking Company"
Racking from the Used Racking Company has helped us to get 33 pallets put neatly away freeing up loads of floor space in our workshop and warehouse! Most of it was brand new and all was in great condition and arrived a day early. 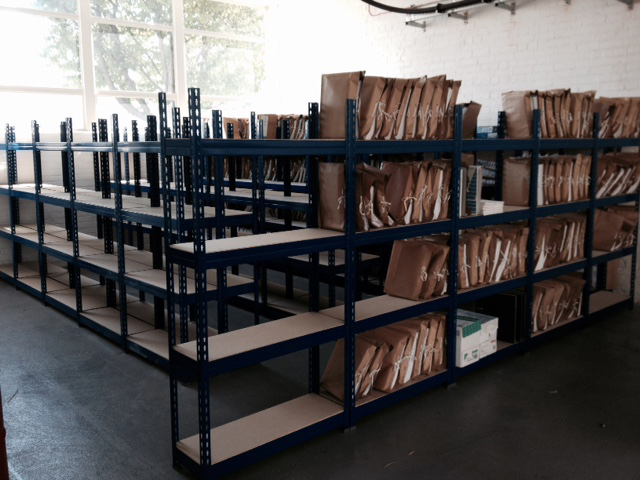 We are made up with our new racking. 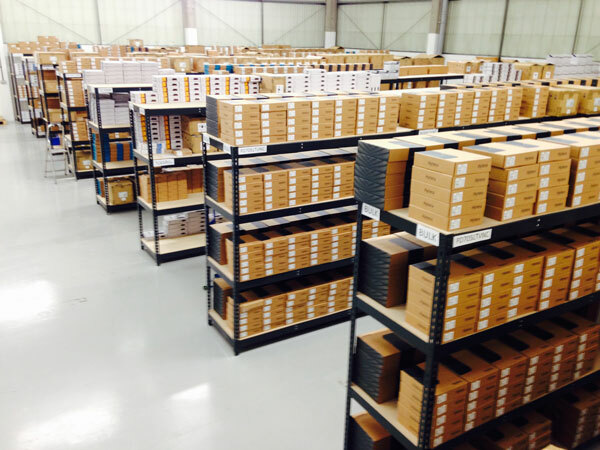 It helps us achieve quicker and more efficient distribution for our clients. I placed an order on a tuesday and received everything on friday the day I asked for. I Will use the Used Racking Company again. 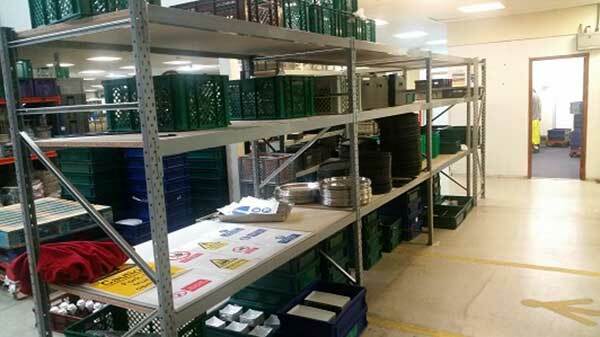 Quality of racking products received spot on, just the job for our requirements. Very easy to assemble, extremely sturdy taking into account individual components not too heavy at all and easily manageable for two people. Very happy with products ordered and received. Pleased with overall service, emails answered promptly and efficiently, all products in stock. Delivery time quoted quite quick with delivery arriving bang on time as stated. 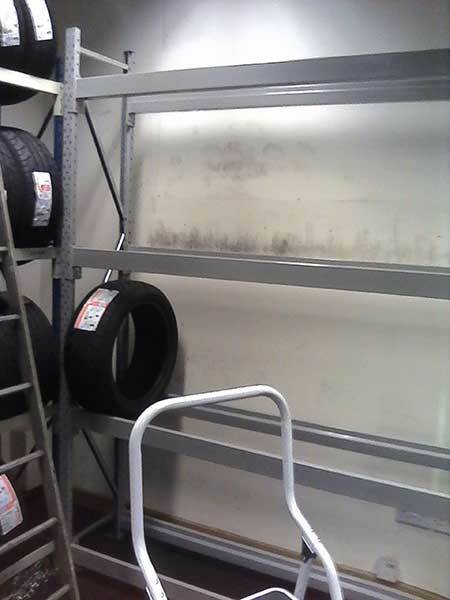 We were VERY impressed with the quality of the racking and could be forgiven for thinking it was brand new. The quality and finish is superb and easy to construct. Whilst we had an item that had unfortunately been damaged in transit, customer service were swift in sorting a replacement that arrived the next day (I believe). 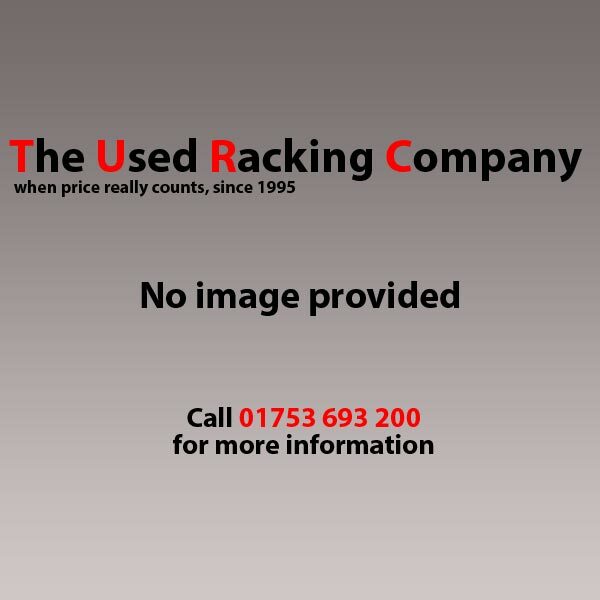 Could highly recommend The Used Racking Company, their products as well as the customer service they gave us. 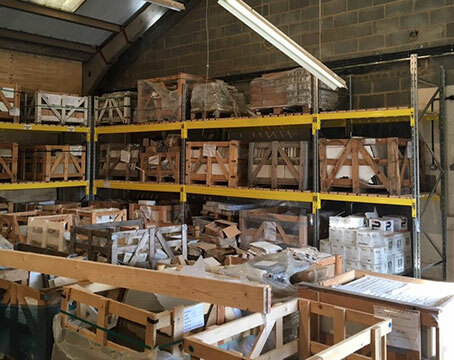 Always a pleasure to deal with the The Used Pallet Co. Have bought from you on several accessions. Always a good deal and always a good product. The racking has been delivered! Thankyou for your help! We are a medium size company growing quickly. I’m sure I will be back for more racking soon. 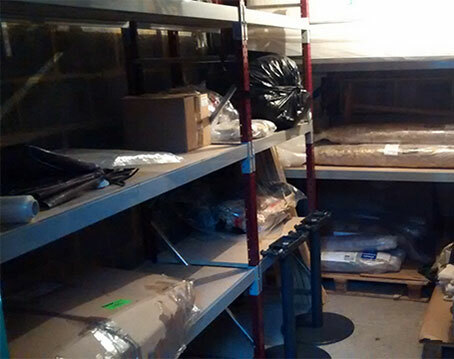 We have a fairly tight storage area that we haven’t quite finished filling up so a little hard to get a flattering pic – please find attached. 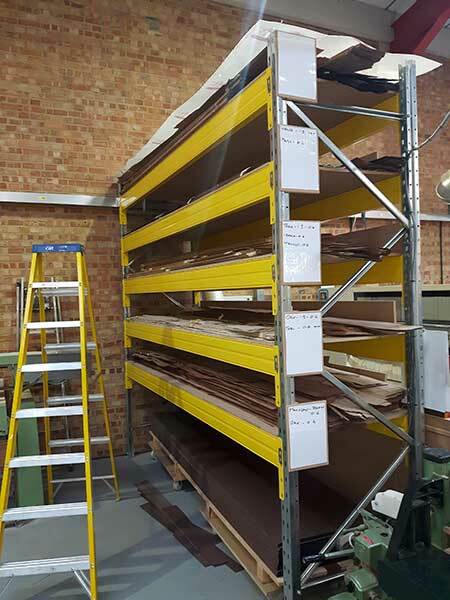 We have been very impressed with the quality of TURC longspan shelving and also the speed at which it can be assembled. Super strong and super quick! We are repeat customers with you and value your personal service and can do attitude. 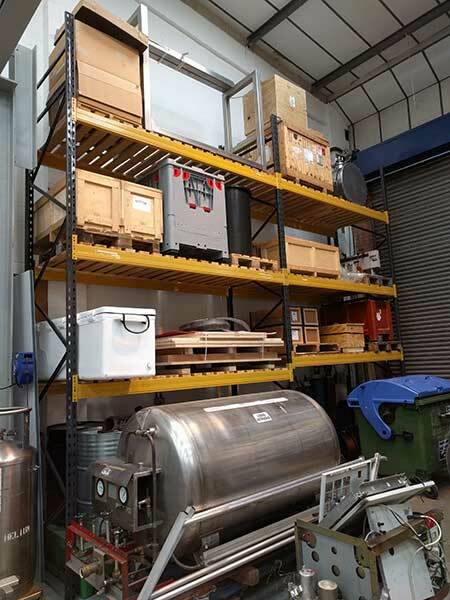 When we hopefully expand in the not too distant future, we will know to call TURC for our additional shelving and racking requirement. Signed lease on 15th Dec, first pic. Racking arrived on 17th Dec and installed, second pic. 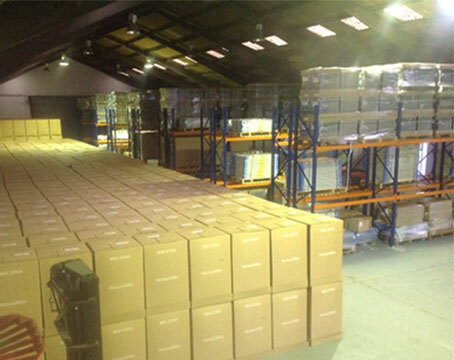 Warehouse full 24th Dec, third pic. Thanks for a terrific service. All installed excellently, efficiently. It looks almost new. 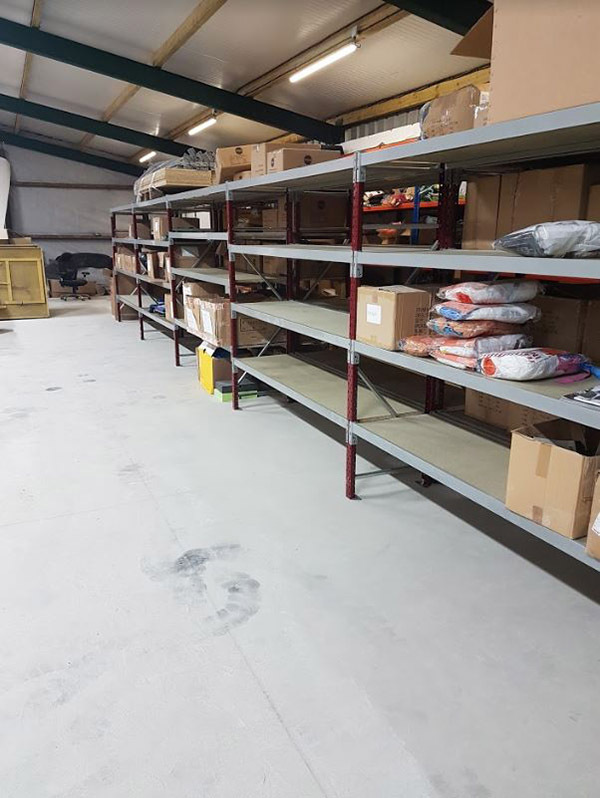 I just wanted to drop you a line to say thank you for your great service, with the recent purchase of our new racking which is all now in place. As a fellow supplier, customers always seem very quick to criticize suppliers and less quick to say well done! Have a Merry Christmas and we won’t hesitate contacting you for more racking when needed. 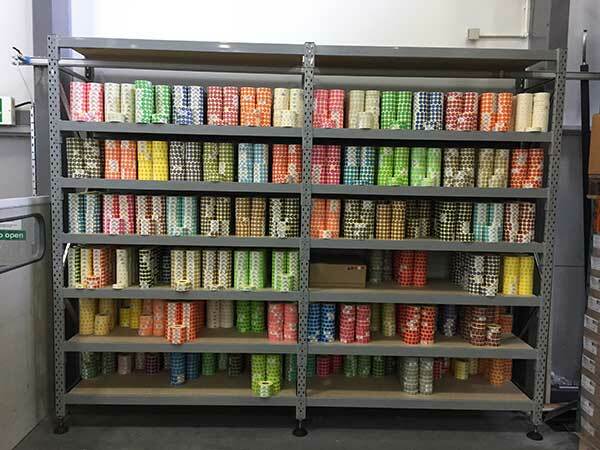 The most professional racking company I contacted and the proof of their quality was in making good a shortage of one piece, delivered free, within 48 hours. You can always judge a good company by how they handle errors, and this was spot on. Second purchase of 'used' shelving from you guys and exactly the same superb service from door to door. Prompt delivery, excellent customer service and extremely helpful. Quality second to none, robust and durable (hence the second buy of the same thing) and put to use straight away. Many thanks again! Great service and product once again. Collection discount much appreciated. 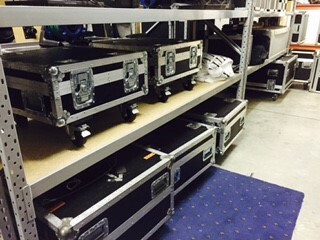 Picture of racking attached with projector flightcases on. 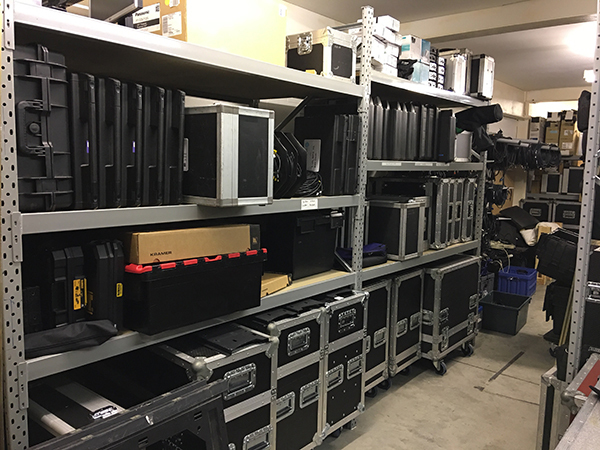 We also use racking for putting projectors on in shows. Usual excellent products, price and service. Even when I needed a quick turnaround. 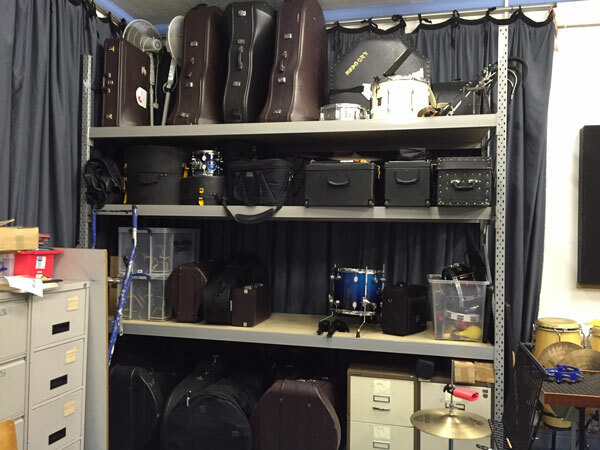 The shelving is of excellent quality, easy to assemble and has been a godsend to our problem of storing musical instruments. The service and advice was very good, from start to finish. The quality of the product was superb, I certainly would not buy new again and the knowledge for the sales representative at HCSS was invaluable. Delivery booked in and arrived on time. 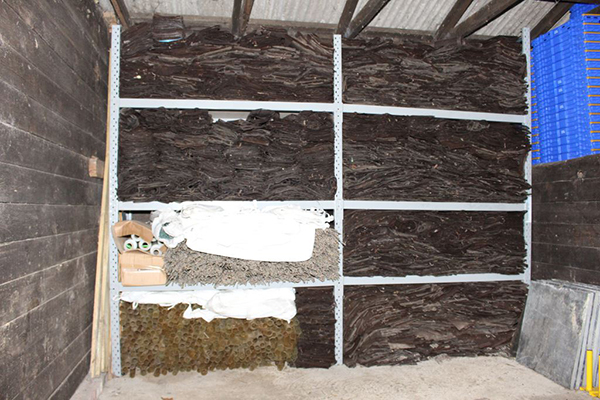 We are extremely satisfied with the product & the overall service supplied from yourselves. In particular the delivery service was excellent, along with the delivery driver clearly explaining how the unit is assembled. 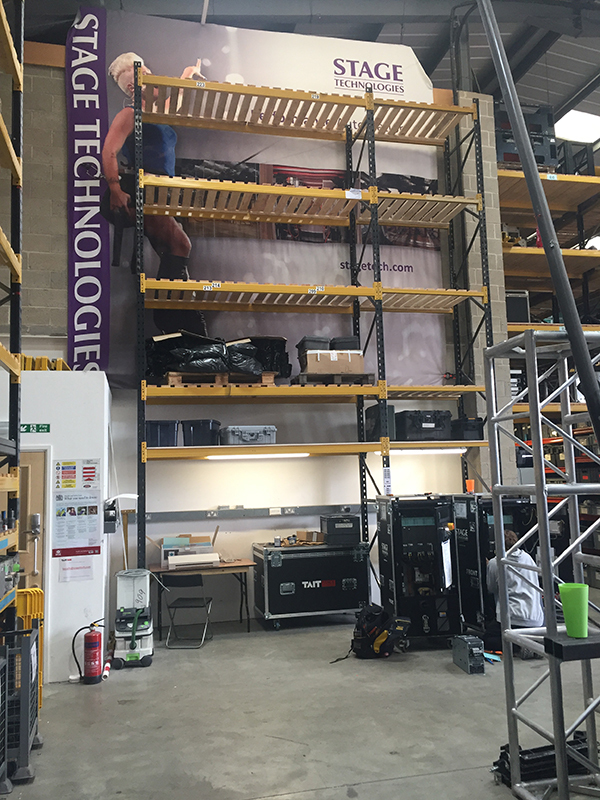 Many thanks and we will certainly be using yourselves in the near future for additional racking solutions. We are very pleased with the product and service. 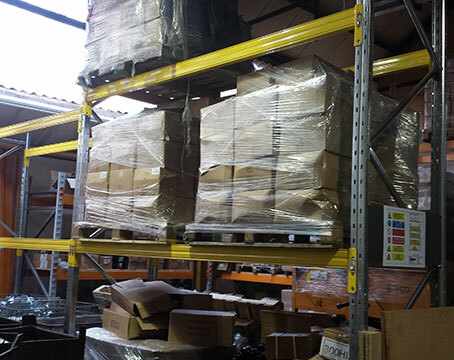 The racking we received was of exceptional quality, exactly as described and look great in our warehouse. The customer service we received was efficient and the delivery was very prompt. I would recommend this company and their products. We have received excellent service from the original quote through to the delivery on site. As usual the service was great and the quality of racking is good. Fast delivery and quick responses to all emails. The racking was easy to assemble and you couldn’t even tell it was used. Highly recommend to all! Our new racking in use. Our shelving was recently purchased from you guys and having researched it for a while the value offered was brilliant. Quality was fantastic, very sturdy and more than capable of handling what we required. The service received right from the gentleman who called me at the beginning all the way through to the guy who delivered it was great. 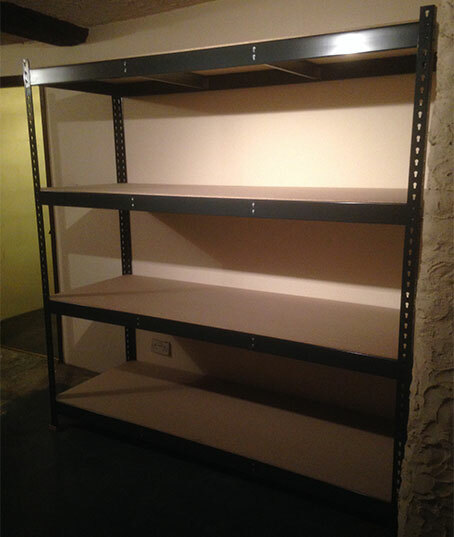 As for 'used racking' it arrived immaculate and was easy to assemble. Great service from lovely people. Will most definitely be back for more. We look forwards to making use of our free bins too!! 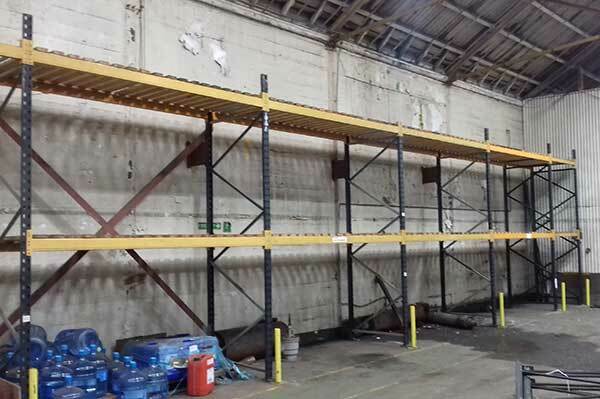 Please find attached photographs of our recently purchased racking. 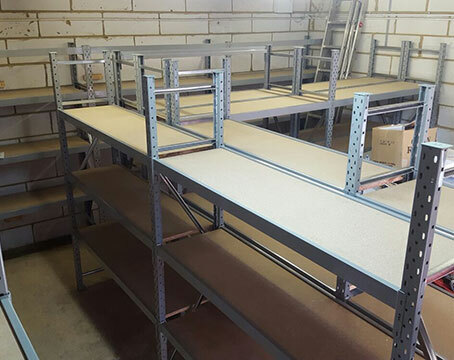 The project is still ongoing but, as you will see, we’ve managed to get some racking built. It’s fitting in perfectly! 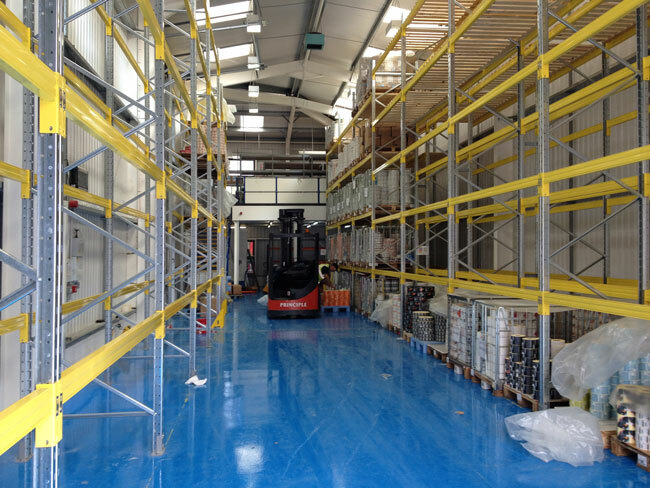 We feel the quality of the racking is very good and suits our needs completely. 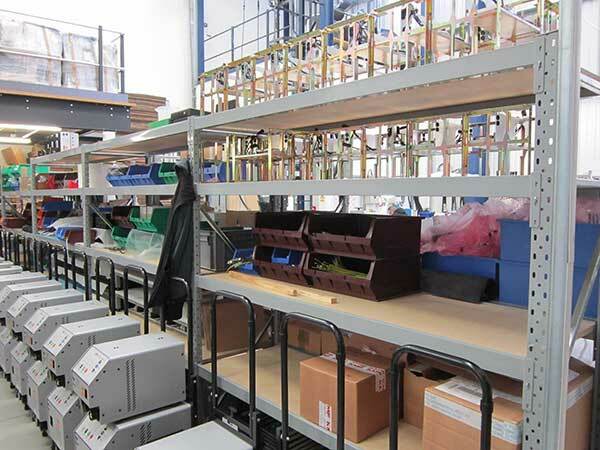 We cannot fault the service received from The Used Racking Company. They listened to our needs and assisted us totally from beginning to end. Ordering was easy and delivery came when expected. We would definitely do business with them again. 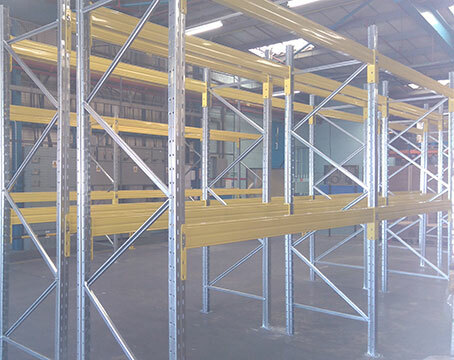 we have put together the racking we received from you last week. 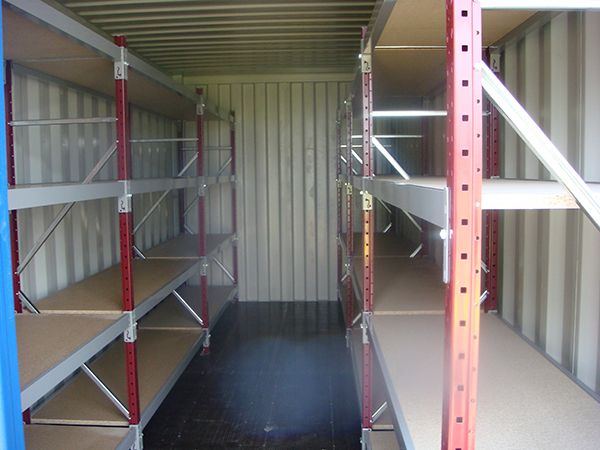 Honest comments; Racking was delivered quickly, in good condition and as described. Satisfied with value for money. Photo attached. Thanks in advance for the bin kit. Product went together very easily and is easy to adjust. Having no fixings to worry about made it all the easier. Delivery was prompt precise and hassle free. Quality - Excellent. Much better than the racks we previously purchased from Big Dug. Easy to put up and down (when we moved them recently). Service - Well priced, and arrived before delivery estimate. Extremely pleased with our purchase, very easy order process and delivery excellent! Only 3 days from order date will use again. I found your installation team to be very efficient and the manager (Dean) was helpful with advice regarding exact location and spacing.